On July 14, 1884, the 24 year-old Anton Chekhov wrote to his friend, the writer and editor Nikolai Leikin, “In front of my window there is a hill with pines, to the right there is a prisoner’s house, and further to the right there is a shabby little town, formerly a capital city…” The town he had in mind was Zvenigorod, where the monument you see pictured here was erected in 2010, on the occasion of the 150th anniversary of Chekhov’s birth. It’s true that Zvenigorod was an important, if brief, way-station for the new doctor and future writer. It was here, just following his graduation from the school of medicine at Moscow University, that he first practiced medicine professionally. There was only one doctor in the city and it was his duty, when leaving on vacation, to find a replacement for his time of absence. Chekhov was the choice, in this case. He spent two weeks as the temporary supervisor of the regional hospital in Zvenigorod, apparently seeing hundreds of patients and taking part in autopsies. It is considered that his stories “The Dead Body” and “The Investigator” published, respectively, in 1885 and 1887 in Petersburg Newspaper under the pseudonym of A. Chekhonte, were inspired by his experiences here. 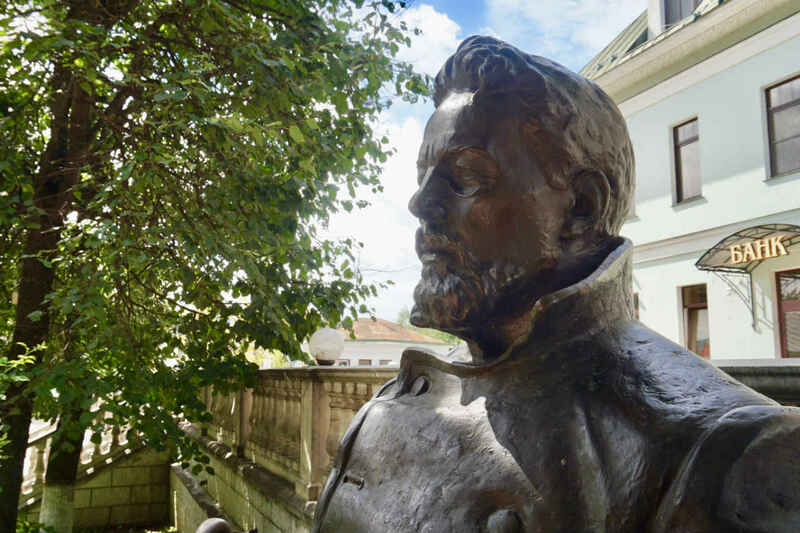 Zvenigorod has done a decent job keeping the memory of Chekhov alive. The house where he lived with his brother Ivan on the Istra River is still standing. The hospital where he worked bears his name, and on the hospital grounds both a bust and a plaque commemorate his presence there. 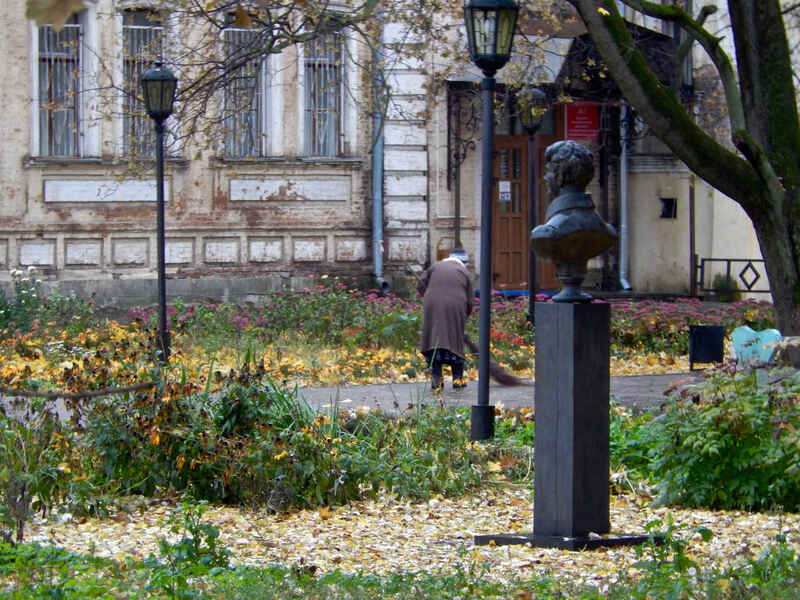 It is safe to say I will never again have the opportunity to find and photograph those items, so fans of Chekhov’s life in Zvenigorod will have to dig deeper than this to find information and images of them. My train of knowledge stops here. 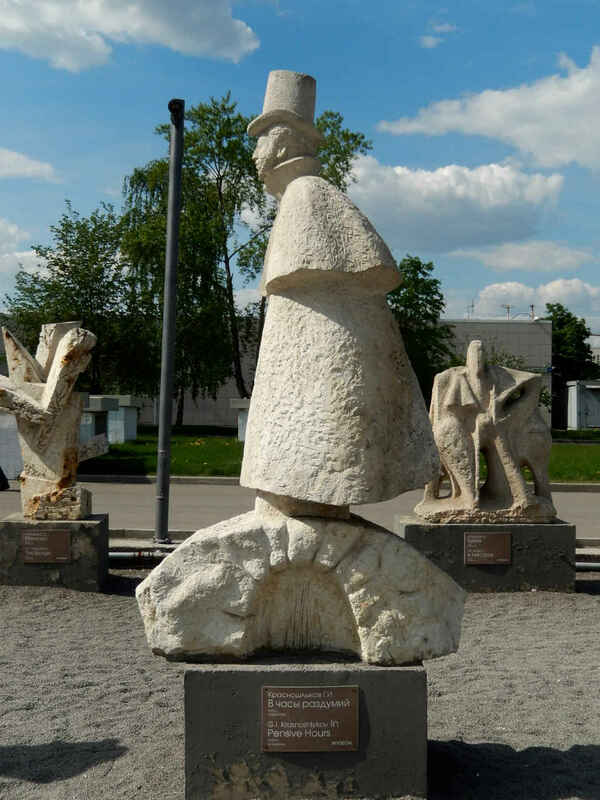 This monument – relatively large once you find it, and quite elusive until you do – stands in a city square between Ukrainskaya and Moskovskaya Streets. 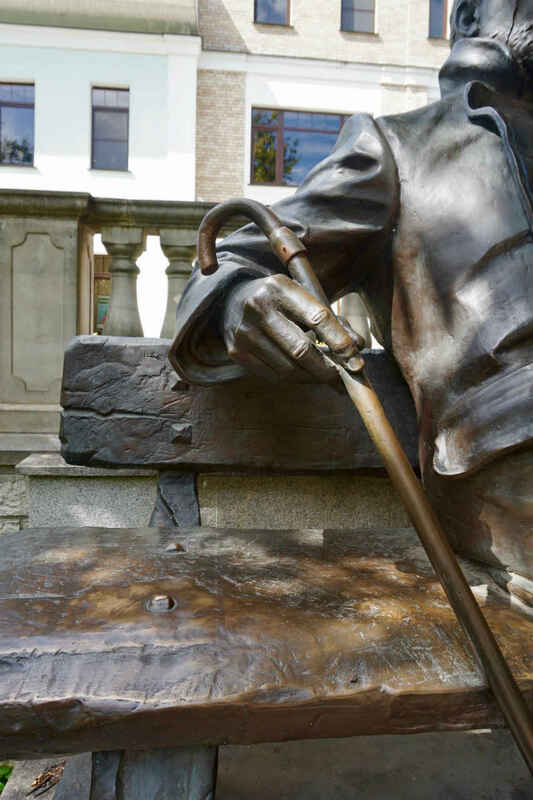 It was done with an admirable degree of professionalism and affection by sculptor Vladimir Kurochkin. 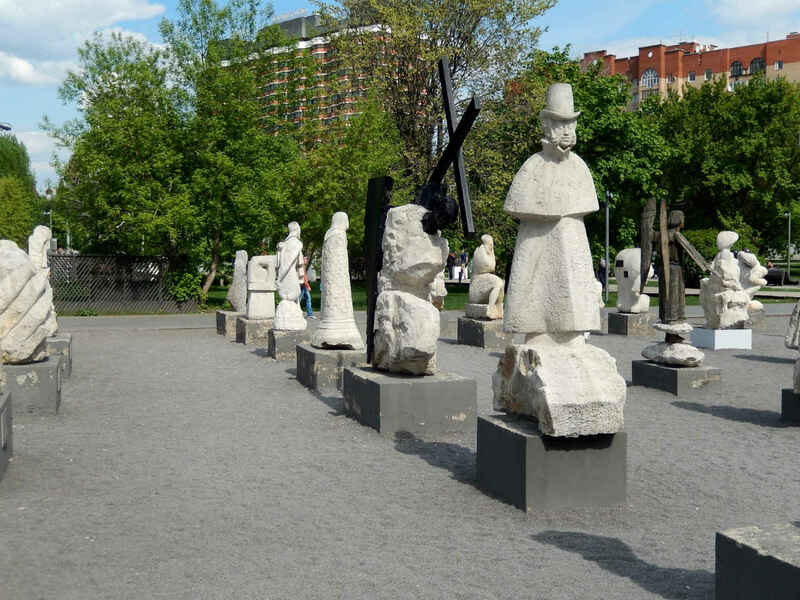 As his website shows, Kurochkin has done a number of sculptures on artistic themes (primarily Russian writers and Western painters), but the bulk of his public works – busts and monuments – has been devoted to military figures. The Zvenigorod Chekhov is rather routine. 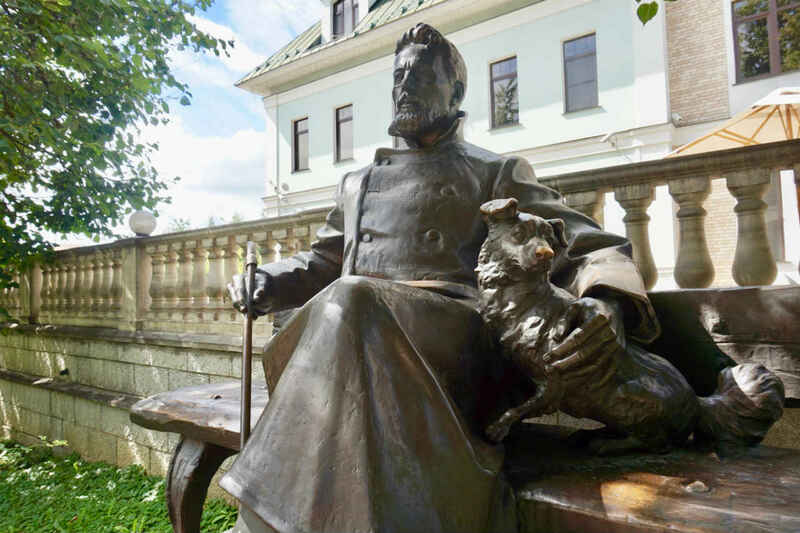 Everything is in place, the dog, the walking cane, the pince nez, the goatee, the overcoat… everything you might expect to see in a likeness of Chekhov. The facial similarity meets our expectations, and – no small thing, I suspect, – the hands are sensitive and gentle. 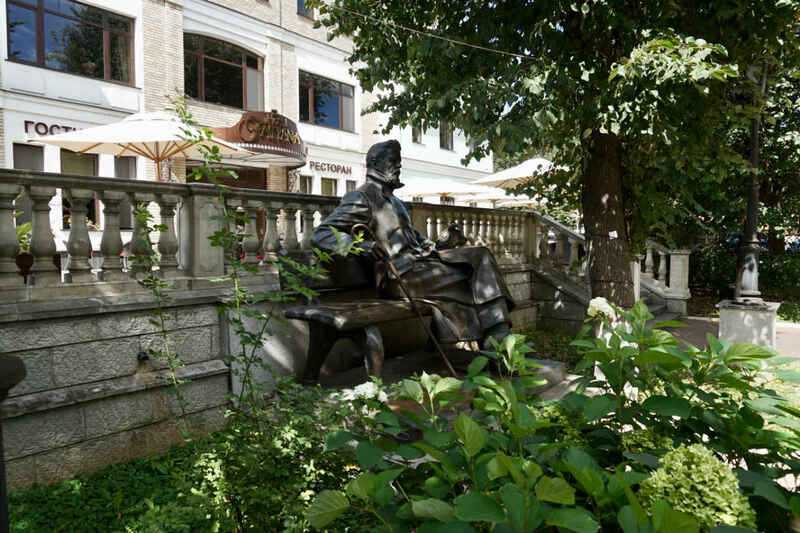 Another nice aspect is the bench on which Chekhov sits. 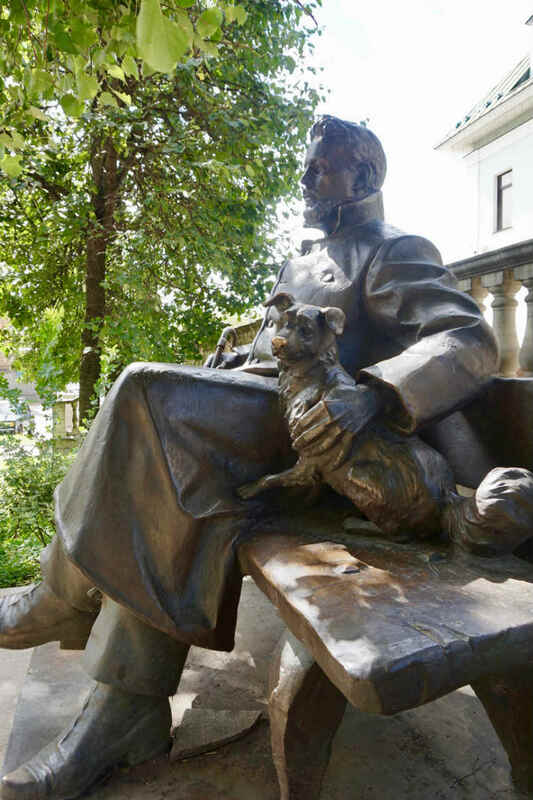 It is part of the monument, so that visitors are encouraged to sit down with the great man on common ground and share some thoughts, or even give his dog a scratch behind its perky ears. 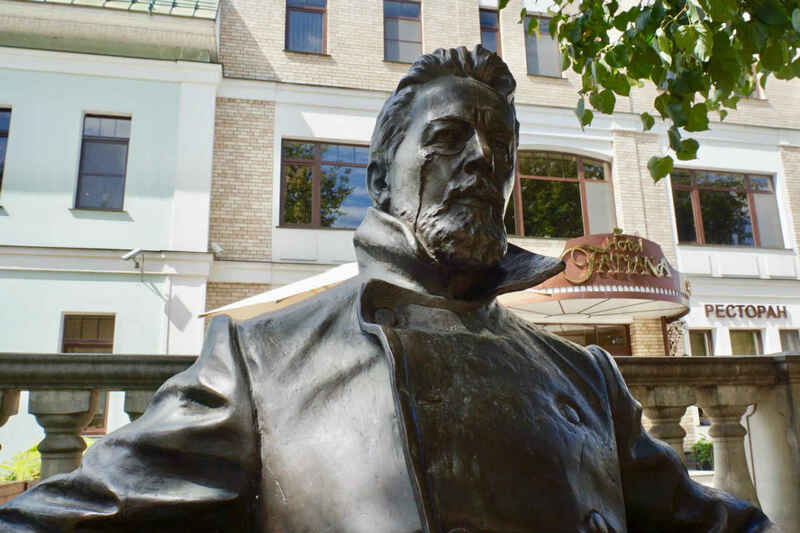 This is the “great” Chekhov here, not the young man who came to begin his career in medicine, but the famed and respected writer who apparently even considered buying a dacha in Zvenigorod in 1903, about a year before he died. He came back to visit the town with the potential purchase in mind, but nothing ever came of it. Perhaps that explains the somewhat blank look in his eyes? 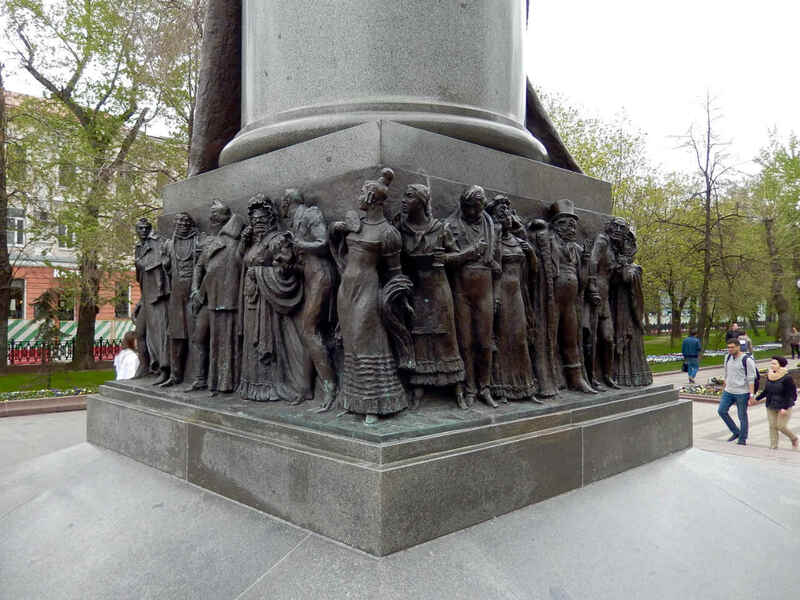 If I’m coming across as underwhelmed in my response to this monument, it’s because I am. But I think the surroundings also have something to do with it. The park itself, for all its motley greenery, is quite faceless. Furthermore, Chekhov is shoved way off to the side for some reason. He is backed right up against a fence that cannot hide the nondescript contemporary city street right behind him. 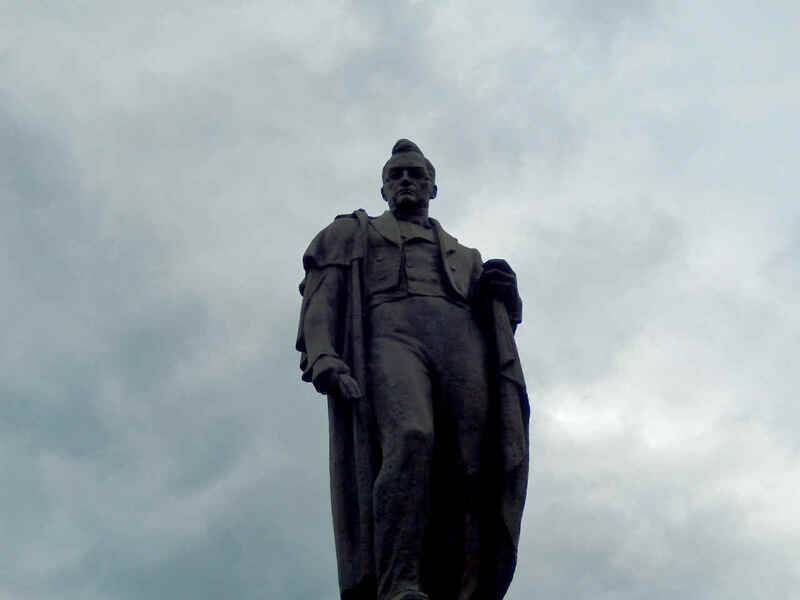 He’s not really part of either world – the modern city or the generic park. 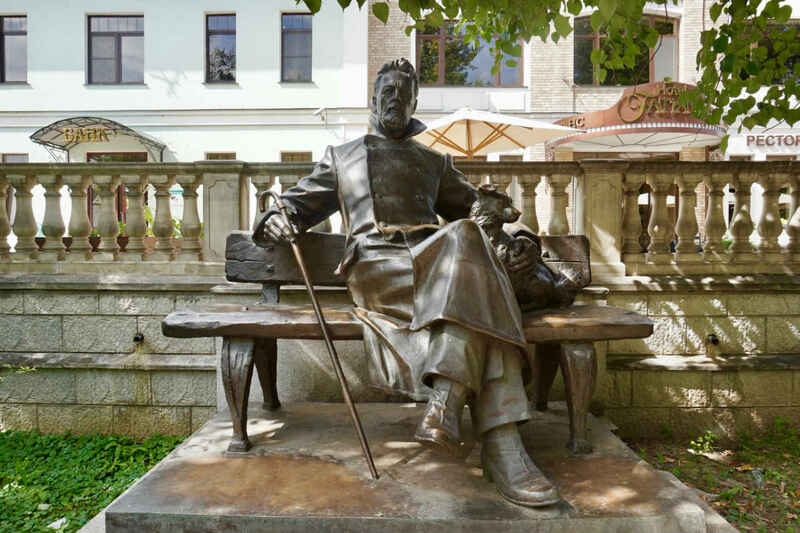 Having said all that, however, I will admit that there is always something pleasant about being able to walk up to Anton Chekhov and sit down with him as if for a chat. 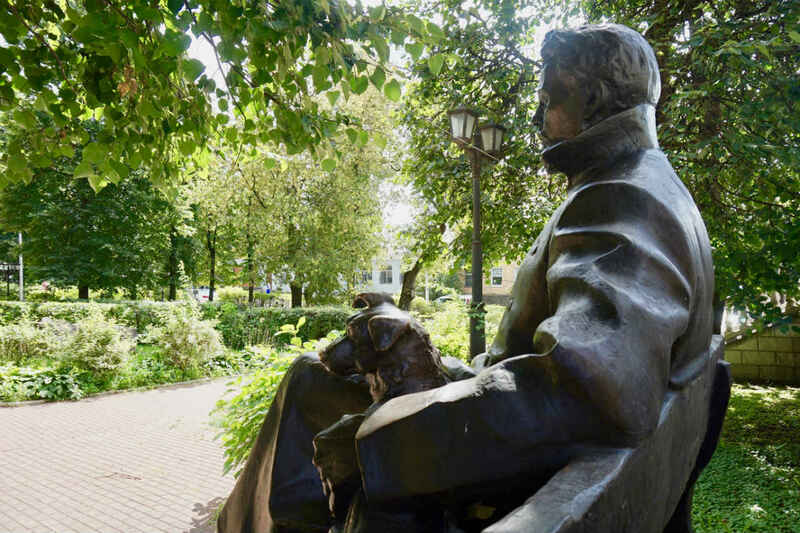 It’s not the excitement, humor and intellectual stimulation you get from wandering around Leonty Usov’s brilliant monument in Tomsk, but it’ll do if you’re in Zvenigorod and in the need of some Chekhov. 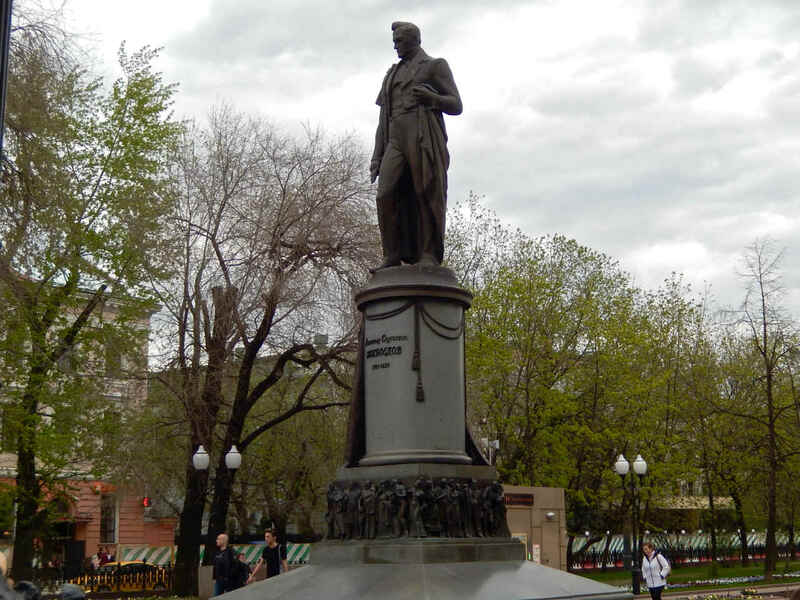 Vasily Zhukovsky is the guy who came before Alexander Pushkin. Talk about getting thrown into the shadows. 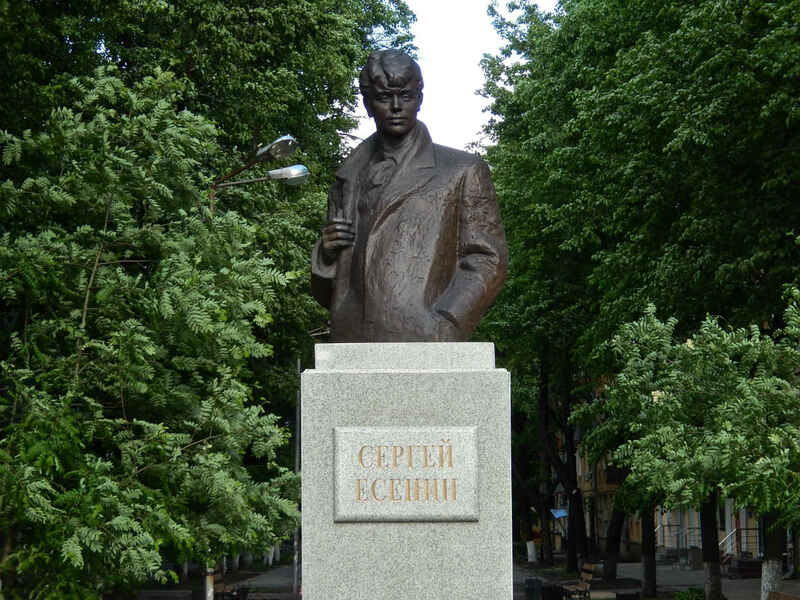 If you’re a baseball fan, call him the Wally Pipp of Russian literature. Or, if American music is your thing, call him the guy who set the stage for Bob Dylan. These are all silly comparisons, of course, intended solely to get a grin or a groan, either of which is fine. 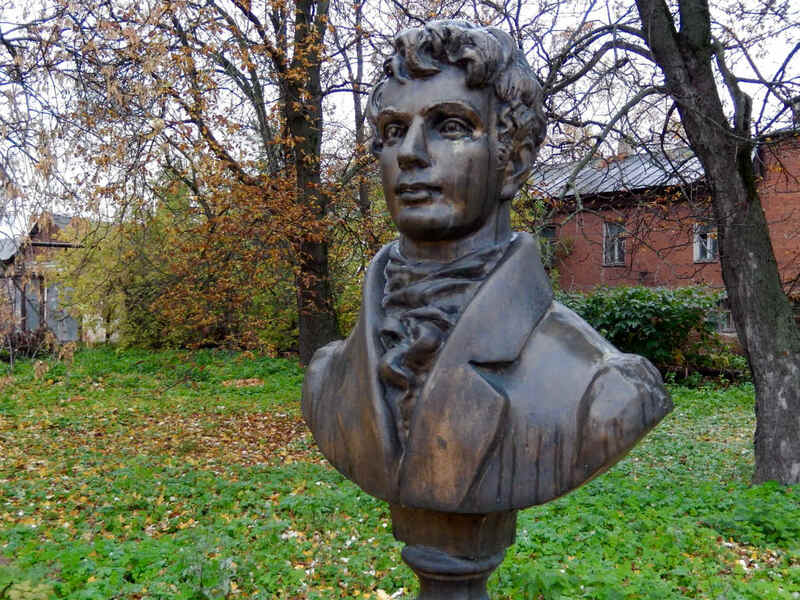 The fact of the matter is that Zhukovsky was the greatest Russian poet for awhile, until Pushkin came along… He had only recently surpassed the previous “great Russian poet” Gavriil Derzhavin, thus taking over that coveted place. Of course, there wasn’t much in it at that time. 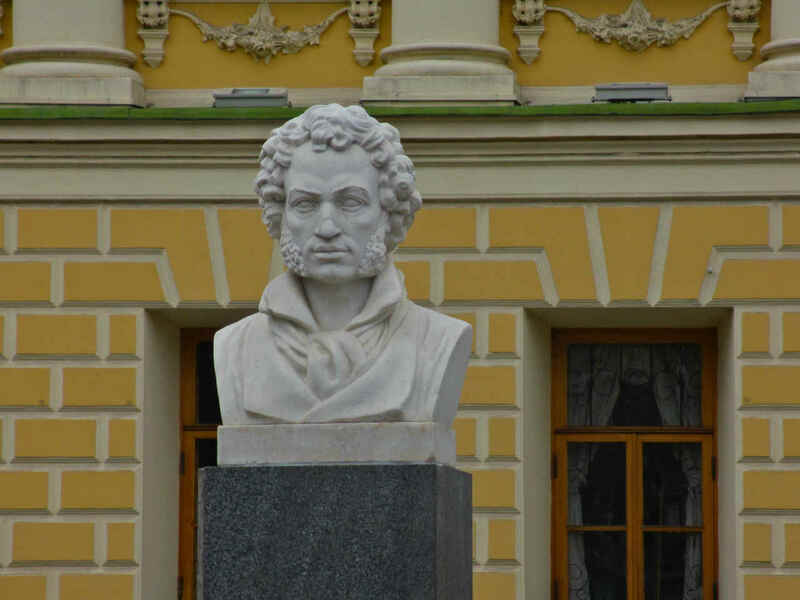 The stakes were raised, a tradition was solidified, a national literary heritage was established once Pushkin came on the scene. The writers who preceded him were stepping stones, of a sort. Still, having said all that, Zhukovsky was, and remains, one of the great Russian writers. He had every right to wear the laurels of “the greatest” in his time. Listen to this lead-in to an article in a Tula online encyclopedia: “Vasily Andreevich Zhukovsky went down in the history of Russian literature as a poet, prose writer, journalist, publisher, editor, critic, artist and educator.” I’ll bet he did windows, too. Zhukovsky was born in the village of Mishenskoe in the Tula region on January 29, 1783. He was the illegitimate son of a provincial landowner (Afanasy Bunin) and a Turkish slave houseworker (Salha – I don’t find her true last name, although she apparently told her son she was from a family of pashas from the Silistra region of Turkey. When forcefully christened, she was given the name of Yelizaveta Dementyevna Turchaninova). Zhukovsky’s last name and patronymic were “lent” him by a neighbor friend. Despite the uncomfortable circumstances of his birth, his father’s wife (and other family members) welcomed him into the family. He was given a good education in Tula and, later, from the age of 14, in Moscow. 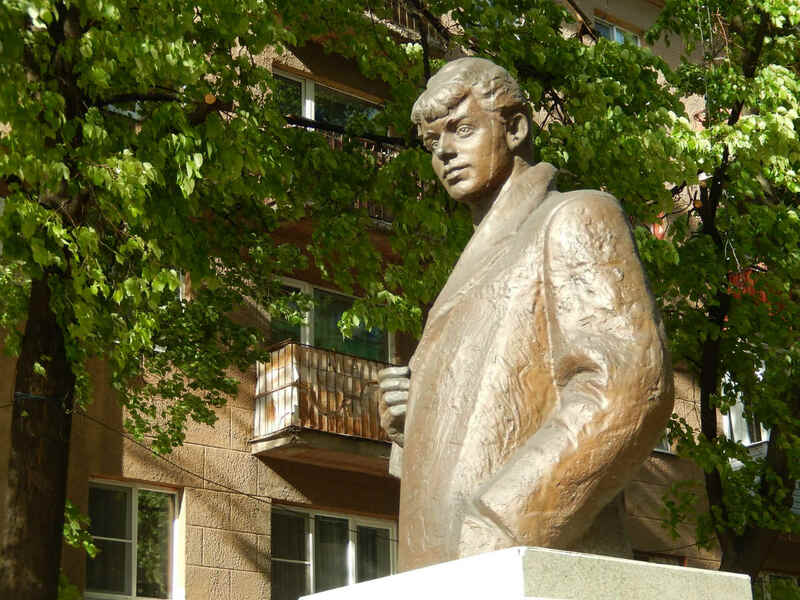 While still in Tula, he attended school while living with his aunt, who often organized literary and artistic salons, thus awakening in the boy his earliest interest in the arts. 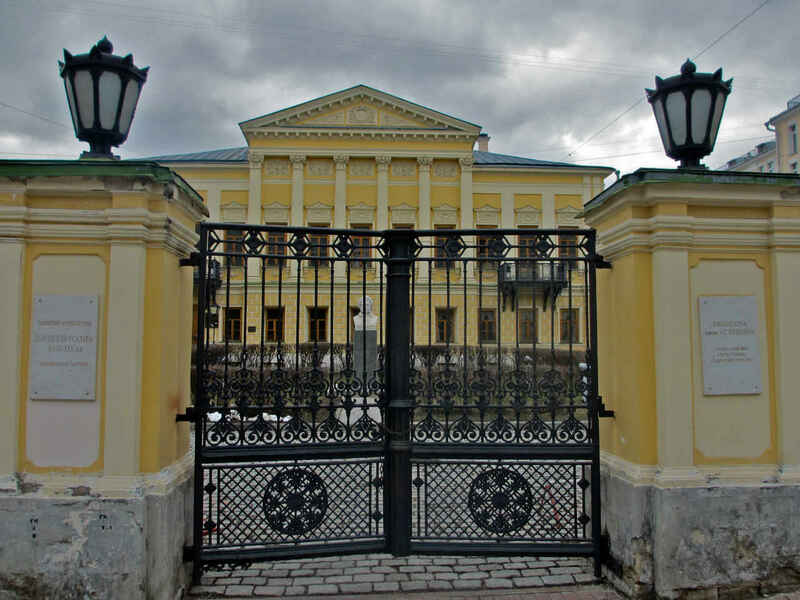 In 1817 he was appointed to teach language and literature to the children of the Russian royal family. He was tutor to Alexander II. He continued to work in this capacity until 1841, at which time he moved to Germany where he married the 18 year-old daughter of one of his friends and sired a son and a daughter. He died April 12, 1852, in Baden Baden. Zhukovsky’s first published poem was “With Thoughts at a Tomb” in 1797. 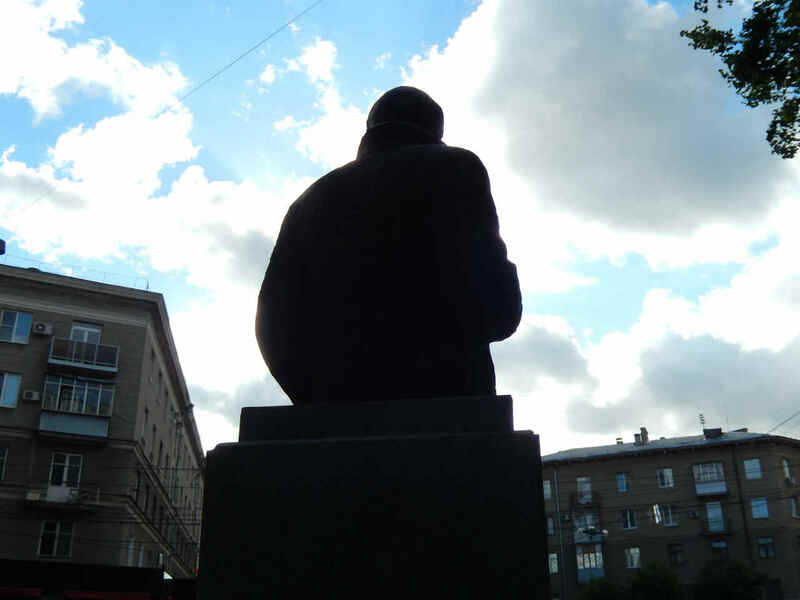 Throughout his early years as a student in Moscow, he published many other poems, most of them exhibiting the popular youthful sentiment of melancholy. 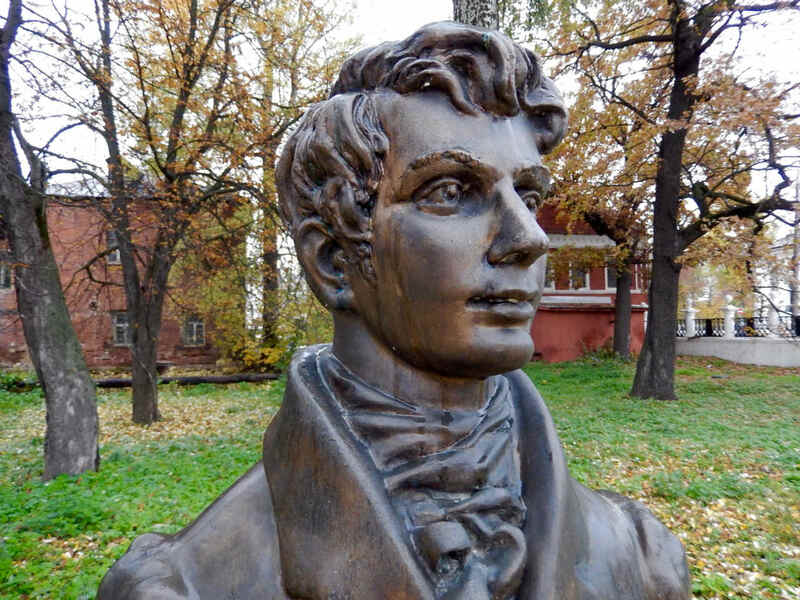 After completing his education at the Moscow University Pansion, the future poet returned to the village of his birth for a full six years (1802-1808). Here he did not publish much, but clearly used his time to work on his craft. As noted in a Tula website, he wrote a letter to his friend Alexander Turgenev at this time, relating that he was continuing a program of self-education, studying world and Russian history, while also acquiring other “serious and weighty” knowledge. During this time he translated and adapted several works from European languages, and tried his hand at prose, also adapting the works of others, including Mikhail Karamzin’s short story “Poor Liza.” Zhukovsky considered the great Karamzin to be his mentor. The first half of the second decade saw Zhukovsky fight in the war against Napoleon only to be mustered out when he fell ill with typhus. At this time he experienced an unhappy love affair that was blocked by the mother of his intended. Both young people suffered long and terribly from their failure to unite. 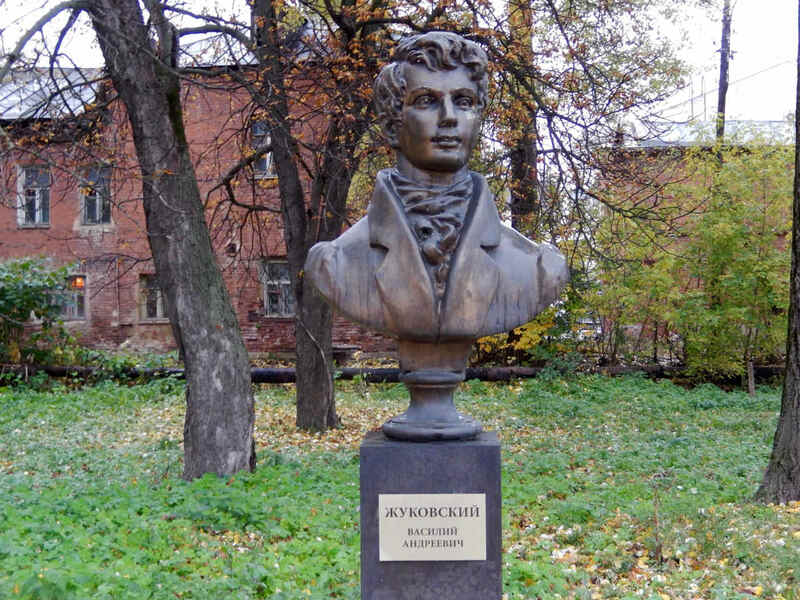 Although it came too late to solve his romantic sufferings, Zhukovsky’s place in the world was settled in 1814 when he wrote “Missive to Emperor Alexander.” This work came to the attention of the Empress Maria Fyodorovna (whom, incidentally, my wife Oksana Mysina played in Vitaly Melnikov’s great film Poor, Poor Pavel) and she reportedly declared on the spot that she wanted this poet to come to St. Petersburg. The poet, indeed, picked up and went to the Russian capital, leaving behind his unhappy love, but not before writing her a beautiful, heart-wrenching letter of farewell. These years – roughly the second decade of the century – were arguably Zhukovsky’s peak as a writer. His value as a translator was enormous, especially when you take into account the fact that his translations of Shakespeare, Schiller, La Fontaine, Goethe, Homer and dozens other major writers, made these works available to the Russian reader for the first time. Consider that Zhukovsky introduced Russia to the world. So good were his translations of classic literature that great numbers of them are still published and read by readers today. It is no wonder that Zhukovsky has always been one of my favorite “characters” in the pantheon of Russian writers. 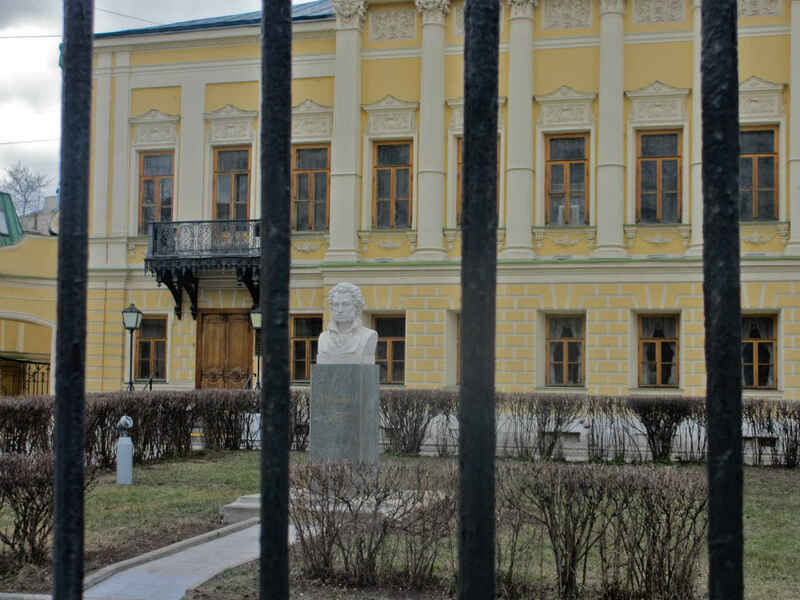 The bust shown here stands in the courtyard of the former Lugin Palace (now the Leo Tolstoy Pedagogical University in Tula), a place that is connected to many of the great cultural figures in Tula. 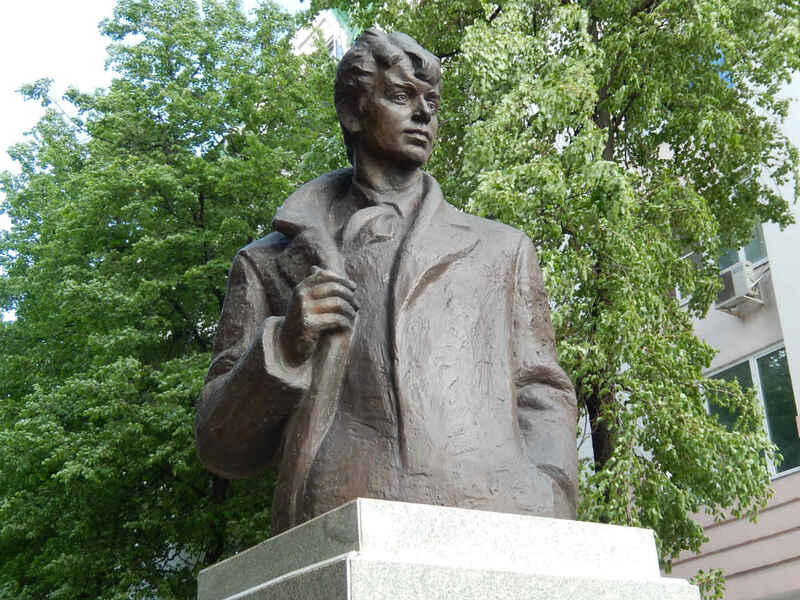 Sculpted by the prolific Moscow sculptor Alexander Burganov, it was unveiled on February 14, 2014. I’m not often happy with Burganov’s work, but I am pleased that he chose to show Zhukovsky in his youth. The usual depiction of Zhukovskys is as a rather rotund, balding, aging man. This likeness (we can hardly know if it really is a likeness, of course) allows us to see Russian literature in its youth, which is precisely where it was when Zhukovsky came along to help it mature. This is the third or fourth time I have photographed this monument, one of Moscow’s most prominent. I have never been satisfied with the pictures and I’m not crazy about what I have to offer today. But I figured if I haven’t been able to do better than this by now, then I never will. 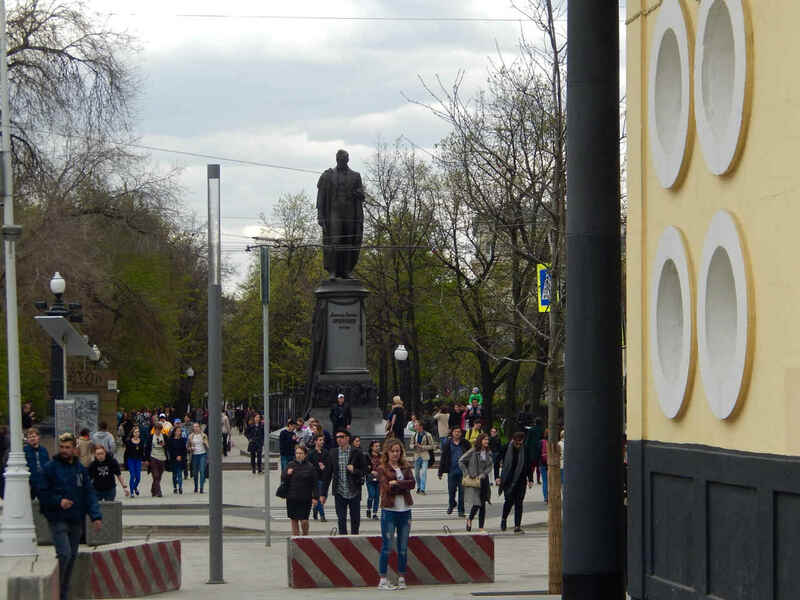 So, here is the monument to playwright and poet Alexander Griboedov which stands at the far end of the segment of the Moscow Garden Boulevard that is called Chistye Prudy (Clean Ponds). 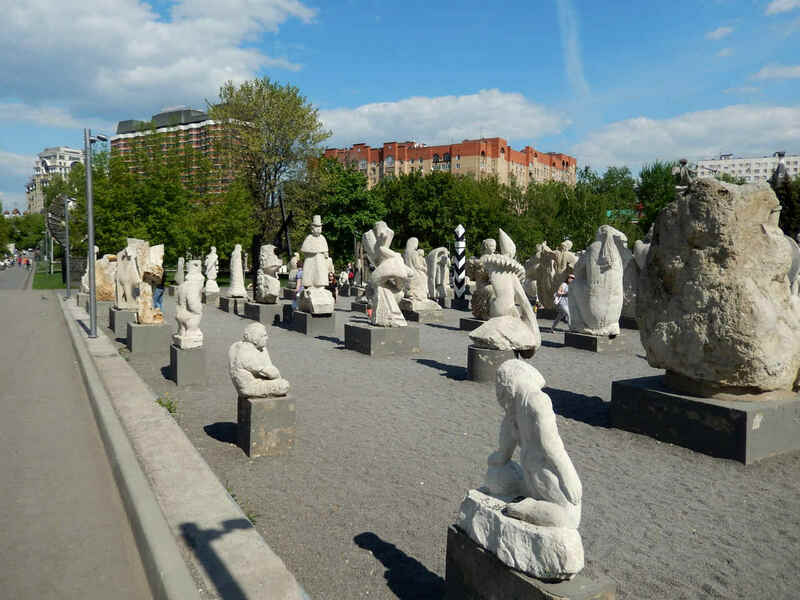 You pass Alexander as you walk from the Chistye Prudy or Turgenevsky metro stops on your way to the actual ponds, the Sovremennik Theater, the Tabakov Theater or many other attractions along the way. One would think this is a fine monument. It is big, that is for sure. It dominates the area around it. It has a nicely classical feel for those who love that kind of thing. But I have a sneaking suspicion that I have had enormous difficulty photographing it for a reason. I just can’t put my finger on it yet. For one, it seems almost as if the sculptor Apollon Manuilov first checked out the monument to Nikolai Gogol on Gogolevsky Boulevard (erected in 1952 – read about that elsewhere in this space) and the Ground Zero monument in Moscow, Pushkin at Pushkin Square (originally erected in 1880 – read about that, too, in this space), before settling on how he would depict Griboedov. It looks like Griboedov, as far as we can tell at this remove; it is, as I’ve said, big; it’s done with all the reverence one could hope for; it’s location is about as good as they come. But I hardly ever notice it when I pass it by (as I often do, or, at least, used to), I don’t see much when I do look, and when I photograph it I seem to get mush. 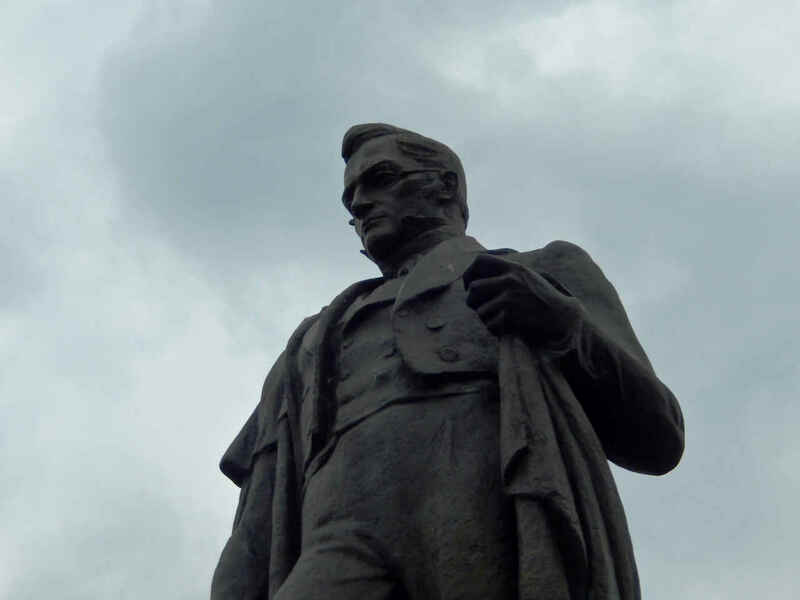 The monument was erected in 1959, on the 130th anniversary of Griboedov’s death. It was a nasty and famous death. Griboedov (1795-1829), sent by the Russian government as an ambassador to Persia, never arrived. He was murdered – sliced up so badly that he could only be identified by a mark on his arm – while on the road in what we now know as Teheran, Iran. 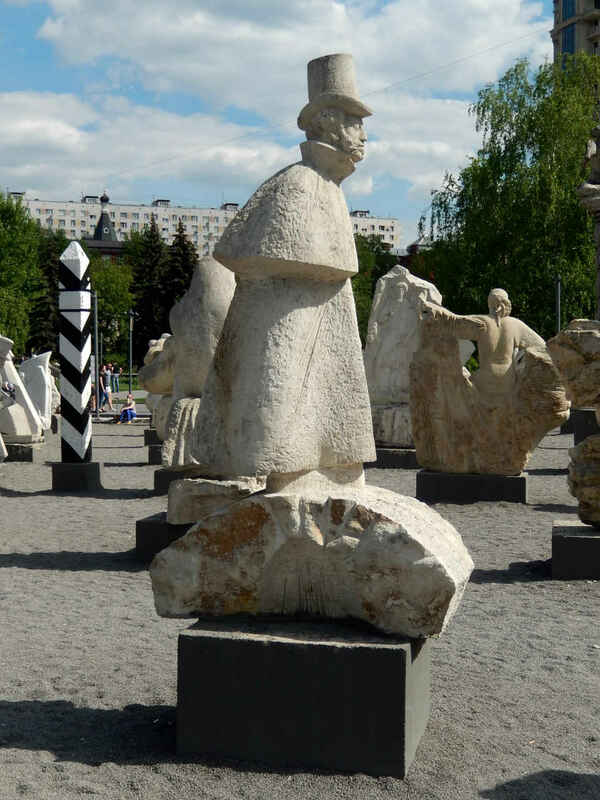 There’s a fairly humorous story about the location of the Griboedov monument. 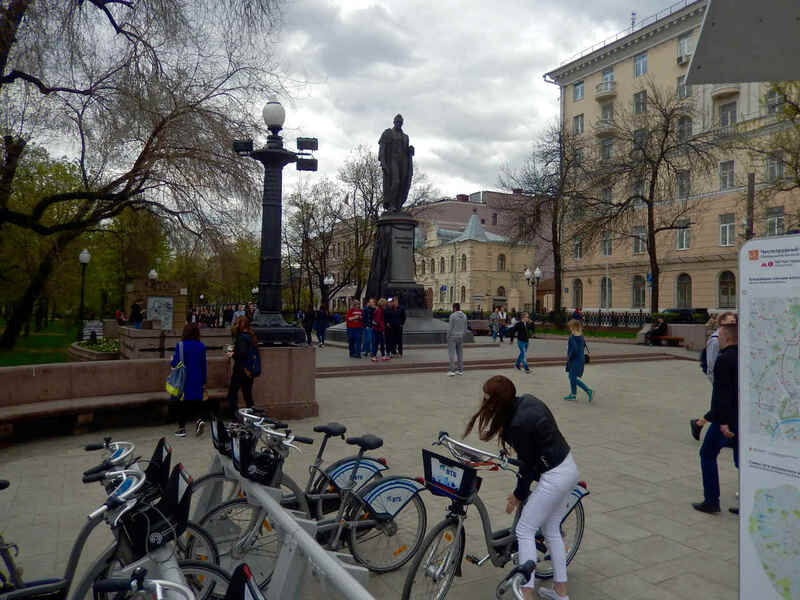 In 1918 the young Soviet government chose to erect a monument to the famed anarchist Mikhail Bakunin here. But it was apparently so “avant-garde” that eye-witnesses swore that when it was unveiled all the horses nearby reared and tried to run away. So ugly and unloved was this monument to Bakunin that it was removed, some say in a week, some say in a year. 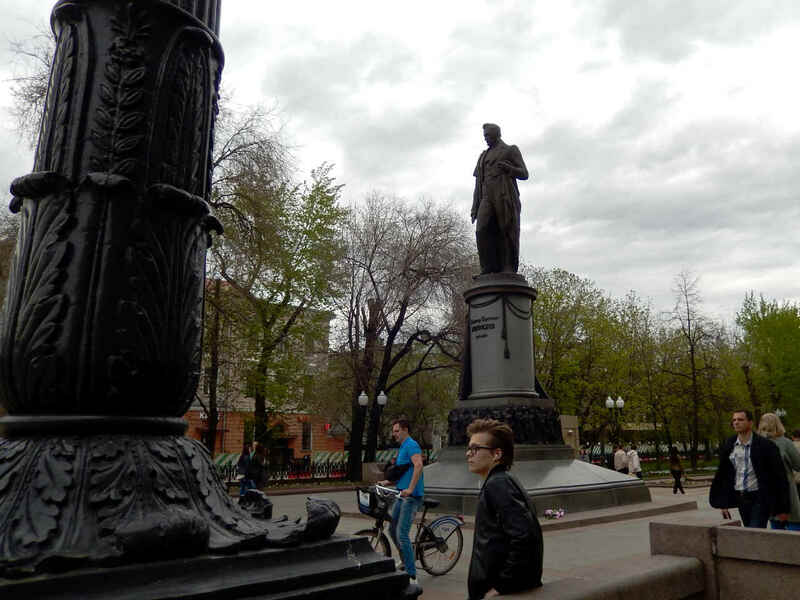 (You can see the Bakunin monument here in the first seven photos. I rather like it.) My understanding is that this location remained empty until the decision was made to erect the monument to Griboedov. 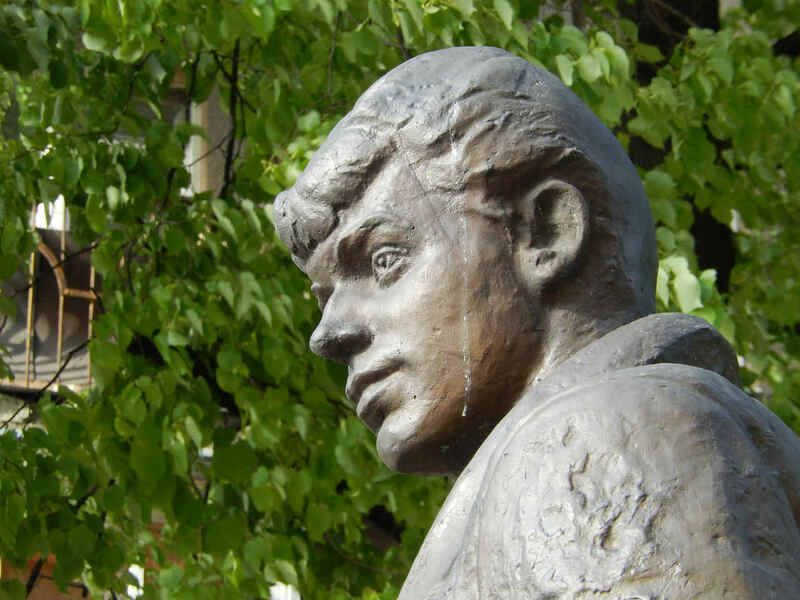 Griboedov’s assassination put an end to a short, brilliant life. He is usually called a one-play wonder, although that is not entirely true. He wrote several short comic plays for the Russian stage. 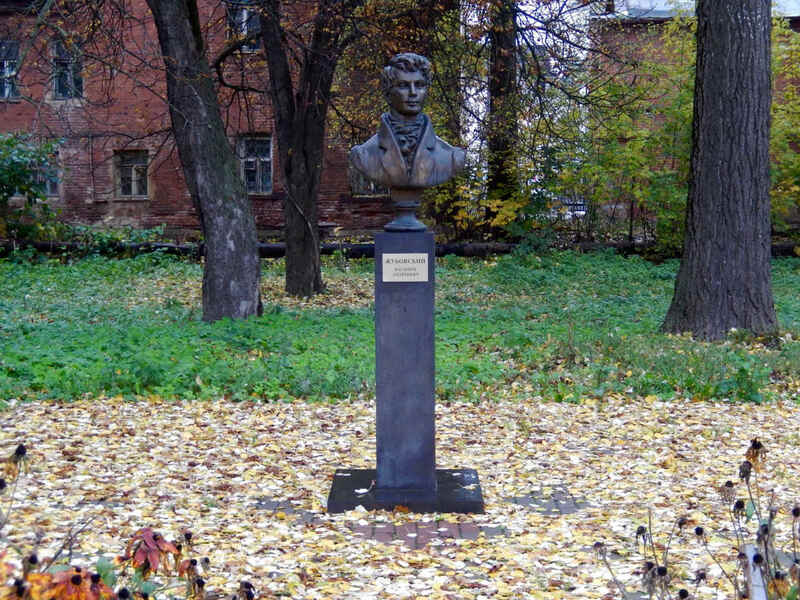 He wrote a good many poems and he wrote a waltz, the Griboedov waltz in E-minor, that is still performed often today. You hear this piece as accompanying music in all kinds of Russian films and theater pieces. His great work, Woe from Wit, was a satire so biting and so true that its phrases were already being picked up and used in Russian society of the time (the early 1820s) because Griboedov or others would read the latest installments at society gatherings. The number of phrases from this play that entered common usage is enormous. Various folks have come up with various numbers, of course, but I have seen lists that go well over 50. All calendars lie! uttered by a woman old enough to be certain of what she is saying. Even the smoke in our Fatherland is sweet and pleasing, says Chatsky after he has just returned and before he becomes disillusioned with his hometown. These days the phrase is usually used with great irony. Where is it best? Where we are not, is an exchange between Chatsky and his former beloved Sofya. Evil tongues are more terrible than a pistol, says the dolt Molchalin in a moment of lucidity. The happy don’t watch the clock, says Sofya. The houses are new but the prejudices are old, says Chatsky. And who are the judges?! asks Chatsky when he hears someone has been slandered. This is sort of, but not entirely, like the English “It takes one to know one.” That leads us in a similar direction anyway. A hero, perhaps, but not of my novel, says Sofya of her former beloved Chatsky. Am I odd? But who isn’t odd? / Only him who looks like every other fool, says Chatsky bitterly. Ranks are bestowed by people, and people are prone to err, Chatsky observes pointedly. Even a phrase like “Everybody lies,” takes its elevation to the level of “winged phrases” thanks to Griboedov and Woe from Wit. The basic notion of the play is also one that has remained acutely timely ever since – an intelligent young Russian man (Chatsky) returns home to Moscow to find that all his old friends are such ignoramuses and bores that Moscow itself seems hostile to him. It is one of the most perfect Russian plays ever written about deep disillusionment. It was written in impeccable verse and, despite its wicked intent – to put the eternal hurt to high Moscow society – it is uproariously funny. In short, it is one of the great Russian plays. And please note: it was written before Pushkin wrote his great plays, before Gogol began writing plays… It is the first play in the Russian canon that still reads and watches today as if it were written by one of our contemporaries. Like many great Russian plays it took awhile to work its way past the censor. Shortly after it was completed in 1824, an attempt by students to perform it in St. Petersburg in 1825 was banned. That ban remained in force throughout Russia proper for decades. It was first performed in its entirely in Yerevan, Armenia, in 1827 with the author present. It was revived in 1828 and 1832 in Tiflis (Tbilisi), Georgia, at the Nersisyan Seminary. Censored versions of the play were performed in 1831 in St. Petersburg and Moscow, while an uncensored version was performed in Kiev (far from the capitals) the same year. Although it was forbidden to be performed in full, truncated productions were mounted in Kharkov, Kazan, Astrakhan, Kaluga, Yaroslavl, Voronezh, Nizhny Novgorod, Odessa and Kronshtadt from 1840 to the mid-1860s. It was first published – with serious cuts – in 1833 and did not appear in published form in its entirety until 1861. One of the great productions – perhaps the first great production – was mounted by Vsevolod Meyerhold in Moscow in 1928 under the title of Woe to Wit, which was Griboedov’s first choice. 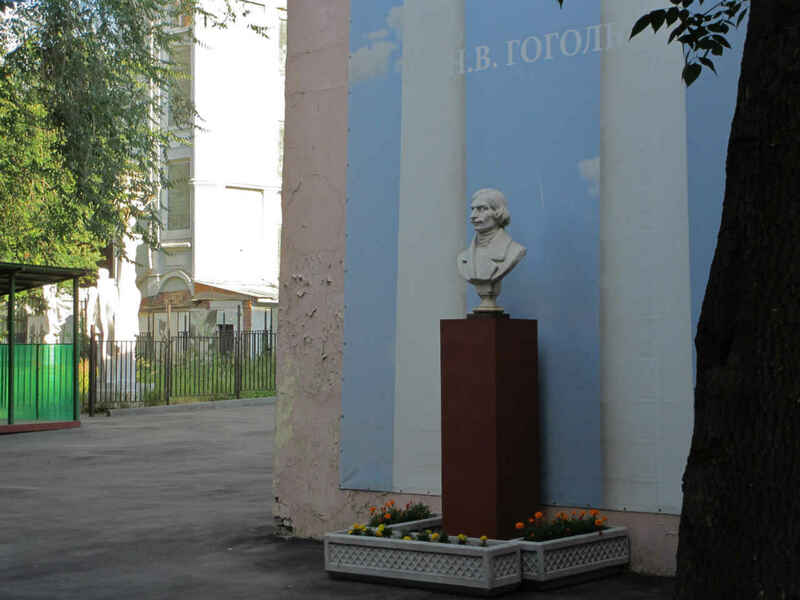 When you think about it, the idea of a school named for Nikolai Gogol is rather weird. Not that I don’t think it’s admirable. Don’t get me wrong. The world’s kids would be a lot better off were they to grow up reading, and understanding, Nikolai Gogol. The key there is “understanding,” of course. 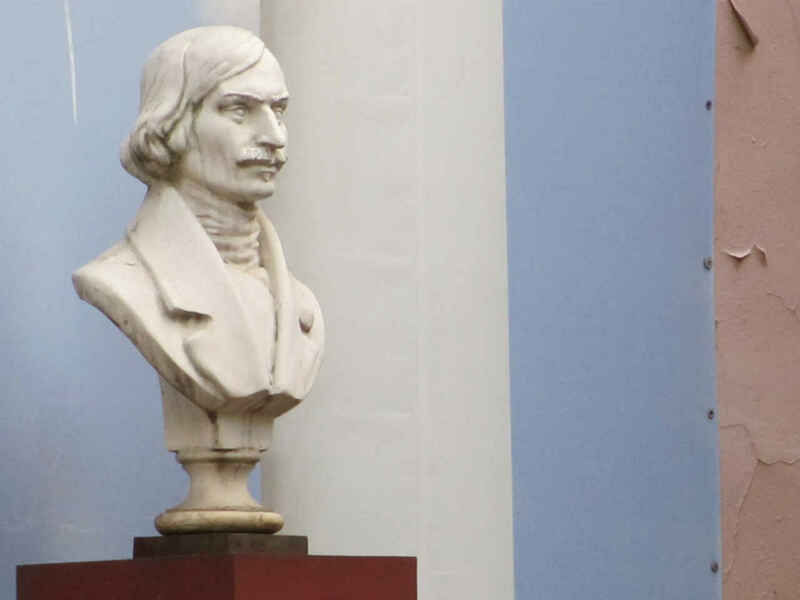 Gogol’s dark vision of the world has led to him being called a satirist for a couple of centuries. There’s no doubt he satirized most anything he could reach with his pen, but just sending stuff up wasn’t what he was about. He peeled back the facade of a phony world, revealing the incongruity, the quirks, the cruelty, the mendacity (thank you, Tennessee Williams! ), the isolation that lurked beneath the surface. I’m not going to give you a Gogol lecture today, but I do want to point out the lovely oddness of the fact that someone chose to name a school after this writer of dark, cutting, often wicked tales. School No. 59, located at 18-20 Starokonyushenny Lane in the Arbat region of Moscow, until recently was what in the U.S. would be called a common elementary/high school. 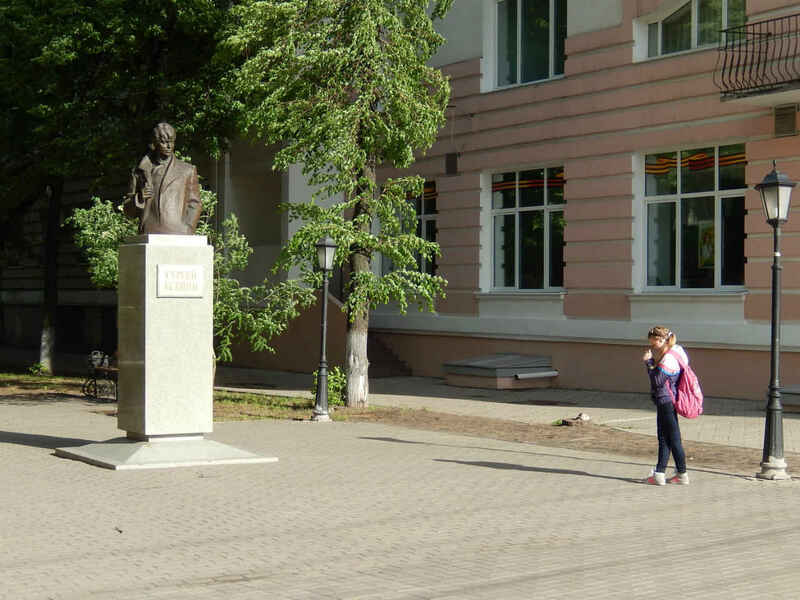 Unlike many Russian schools that focus on specific topics – mathematics, music, the sciences – it was a general-topic school. Since 2013 it has been subsumed in some far-reaching, octupus-like educational conglomerate bearing the name of Gogol’s fellow writer Alexander Griboedov. That’s not of much interest to us, but what happened here in the past is. This is actually the site of a fairly famous place of education. 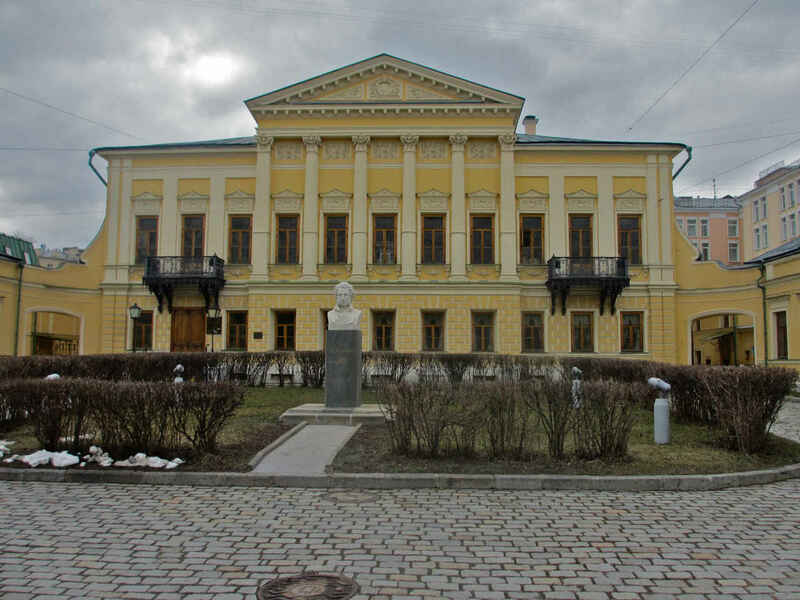 It was originally founded June 8, 1901, across town on Povarskaya Street as a gymnasium (essentially a high school). 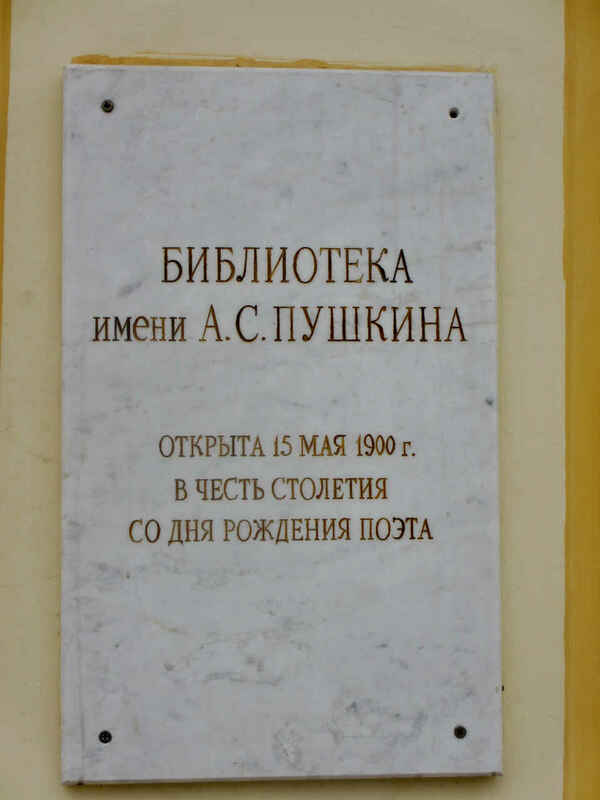 The funding was provided from a grant left by a rich merchant by the name of Ivan Medvednikov, and the gymnasium was called the Medvednikov gymnasium. The building on Starokonyushenny, which still stands today, was opened in 1904. Over the next decade and a half it turned out numerous individuals who subsequently made important contributions to Russian history, science and culture. Among them were famed Russian theatre director Yury Zavadsky (1894-1977), architect and theater designer Georgy Golts (1893-1946), philosopher Sergei Fudel (1900-1977), art historian Sergei Sidorov (1891-1978) and others. The revolution brought changes to the school. In the 1920s alone it changed its name and profile five times. It underwent several more changes until it was named after Gogol on February 9, 1952, 100 years, give or take a month, after the writer’s death. Whatever the school was called, it continued to churn out illustrious students. Vitaly Kostomarov (born 1930), an influential linguist and the future head of the Pushkin Institute of Russian Language, was one of them. You had to know your Kostomarov when studying/teaching Russian at Harvard in my day. 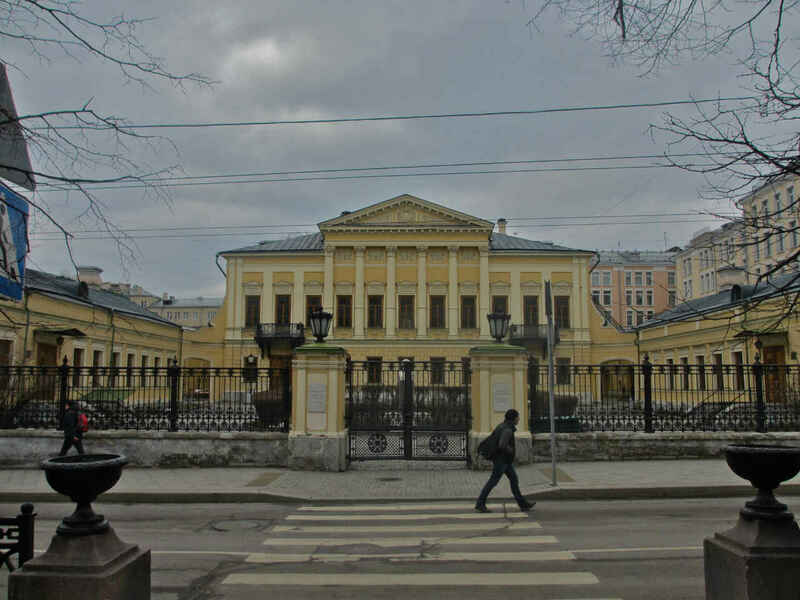 Also matriculating here were the writer and dissident Vladimir Bukovsky (born 1942), philosopher Grigory Pomerants (1918-2013), actors Rostislav Plyatt (1908-1989) and Vyacheslav Shalevich (born 1934), and writers Kir Bulychyov (1934-2003) and Mikhail Shishkin (born 1961). 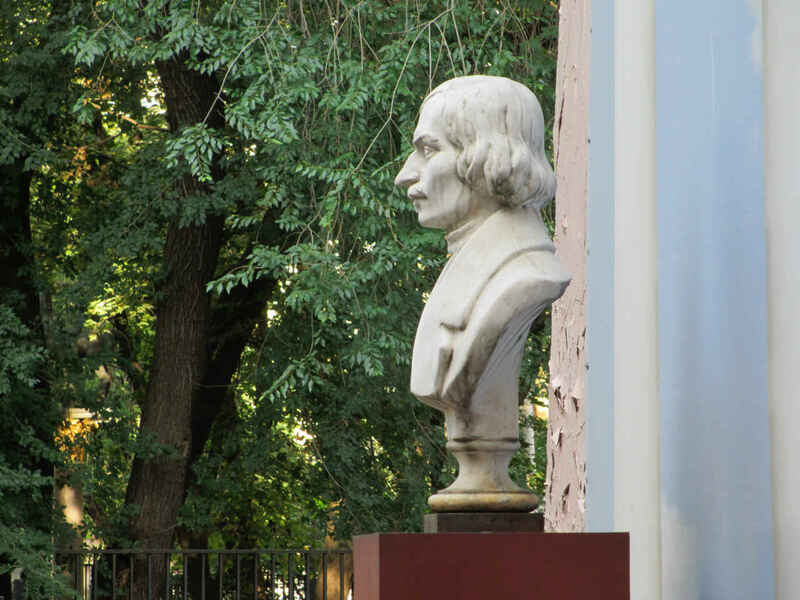 The bust of Gogol that stands in a corner of the school’s courtyard, essentially pleases us because it looks like what you would expect. This is the generic Gogol executed with an attractive hard edge to the features and the gaze. I don’t find anywhere who the sculptor is, but I don’t think I need to. 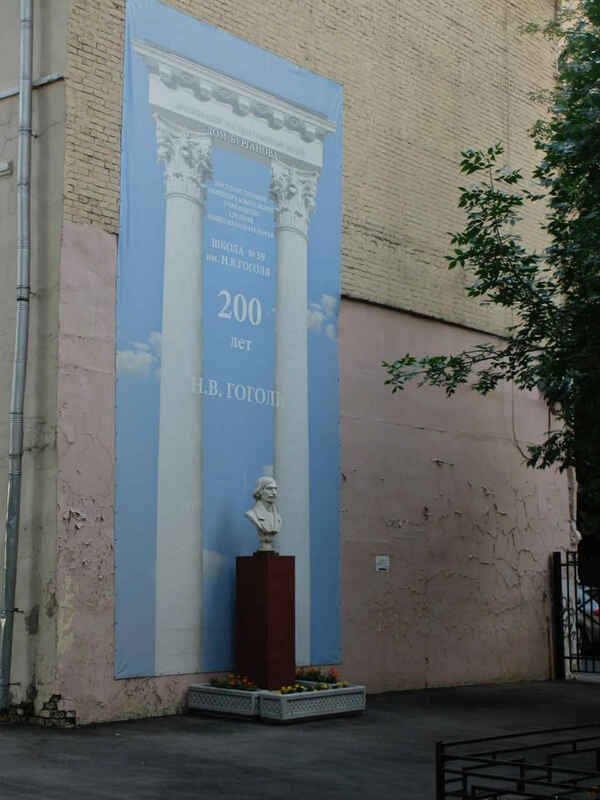 After all, if you back up and take in the bust in its environs, you see that it stands in front of a huge banner topped with the words “Burganov House.” The two Corinthian columns pictured on the banner are photograph images of columns that, indeed, stand outside the Burganov House, which is the semi-gallery and workshop of popular Moscow sculptor Alexander Burganov (born 1935). 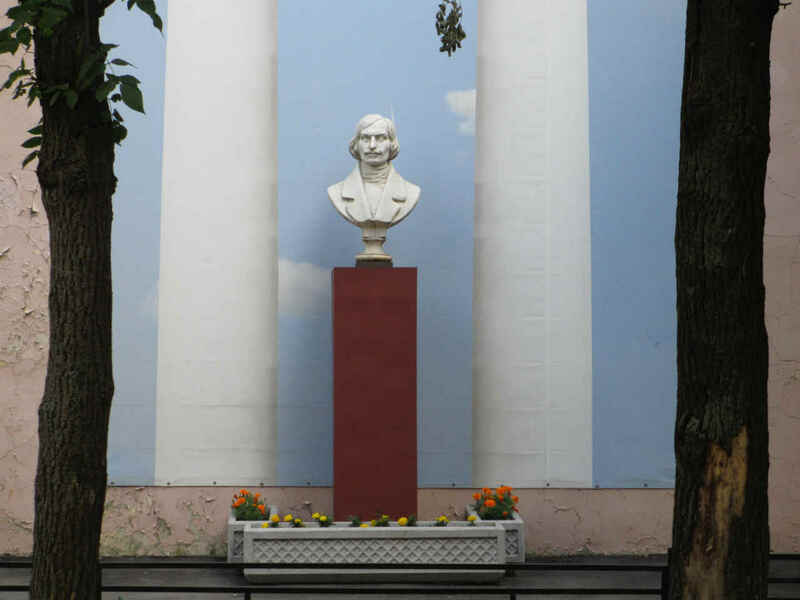 Leave it to Burganov to put up a modest little bust of Gogol and surround it with a huge advertisement to himself. 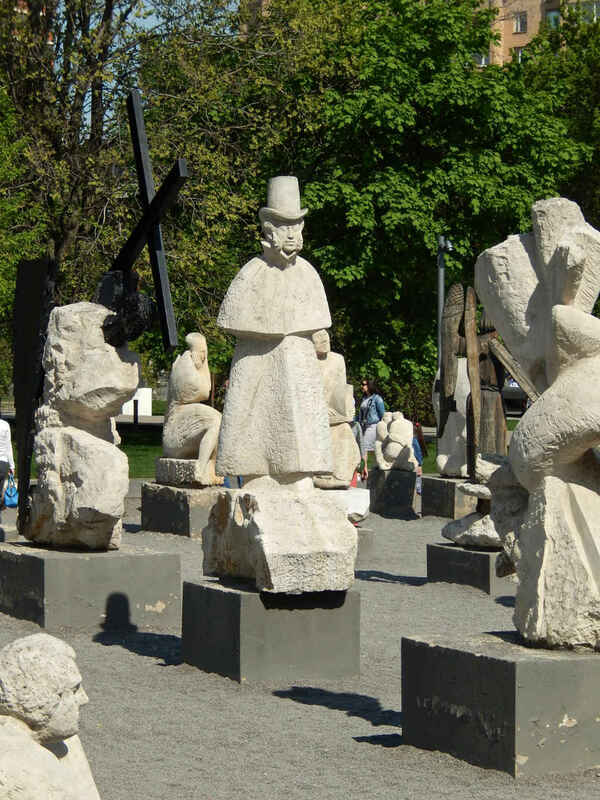 Burganov is a friend of Moscow’s head sculptor Zurab Tsereteli (born 1934), the notorious self-promoting sculpture-factory who makes huge, awful sculptures then tries to give them to cities for free. Usually, they turn them down, showing that most cities of the world have better taste than Moscow. His rejects often end up somewhere in Moscow; too often in the line of sight. 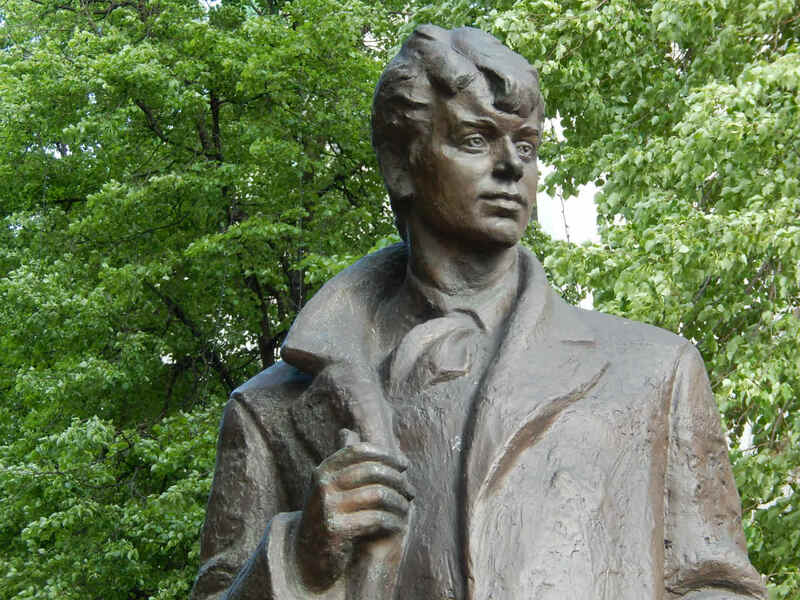 Anyway, Burganov kind of runs around in Tsereteli’s shadow, getting all kinds of prime commissions to “illustrate Moscow with culture.” There’s no denying Burganov’s flair as a sculptor – he’s a pro. But most of his work looks to me like it’s come off a conveyer belt. 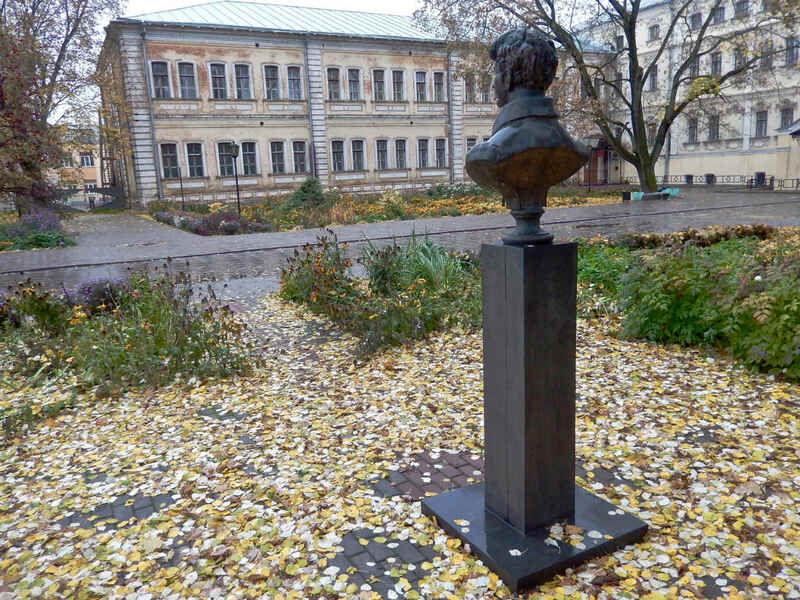 Do I, for example, see anything of Burganov in this Gogol bust? I do not. 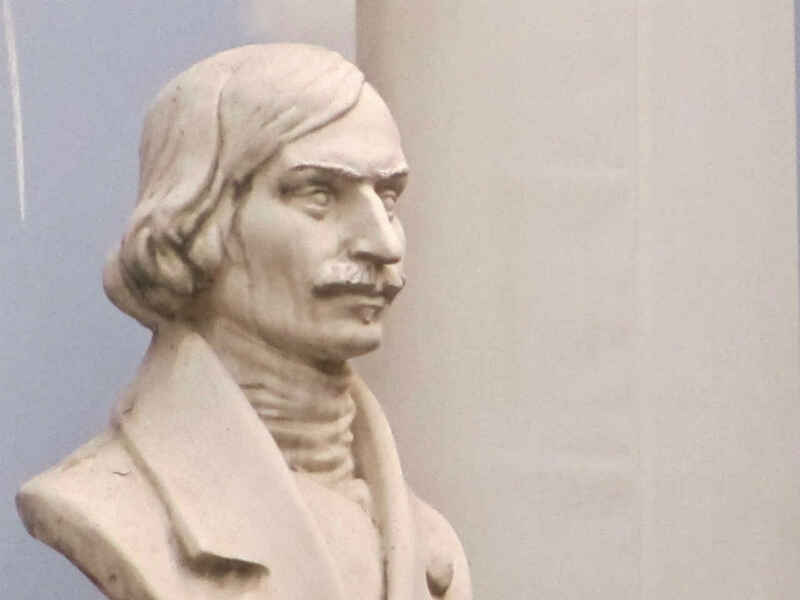 Although I see the work of every other sculptor who has ever sculpted Gogol’s face. By this time the astute among you may have asked themselves the question – so what’s this author’s bone to pick with Burganov? Well, as long as you ask, let me tell you. Back in the deep past a good friend named Mikhail Pushkin was looking for an unusual place to stage Jean Anouilh’s Antigone. 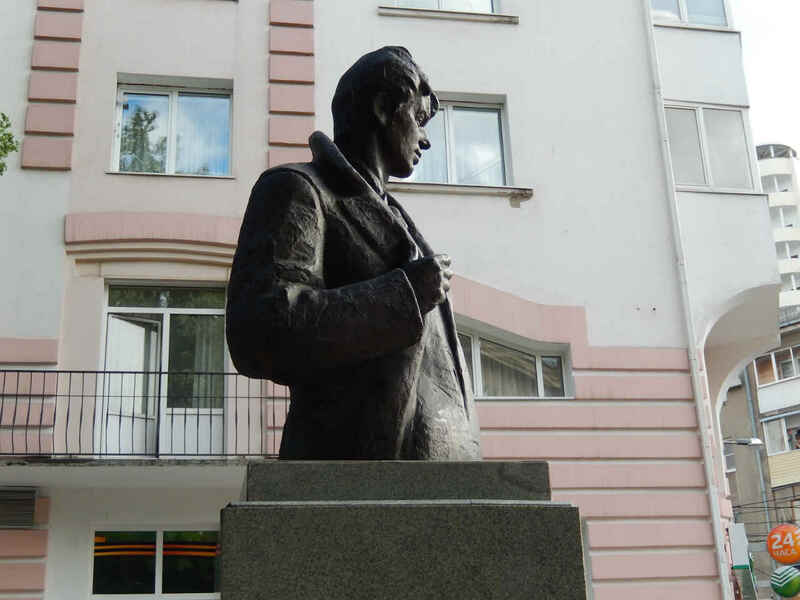 He found Burganov’s studio in the Arbat district and had a talk with the sculptor. Burganov probably thought nothing would come of this proposal and, even if something did, it wouldn’t last long. So he gave his okay. Pushkin staged a brilliant indoor-outdoor Antigone that made use of an underground bunker whose glass windows up top looked out on trees and old brick walls. It was a spectacular production and Burganov was clearly caught off-guard. Somebody had actually done something truly creative in his midst and it irked the conveyer-belt sculptor. 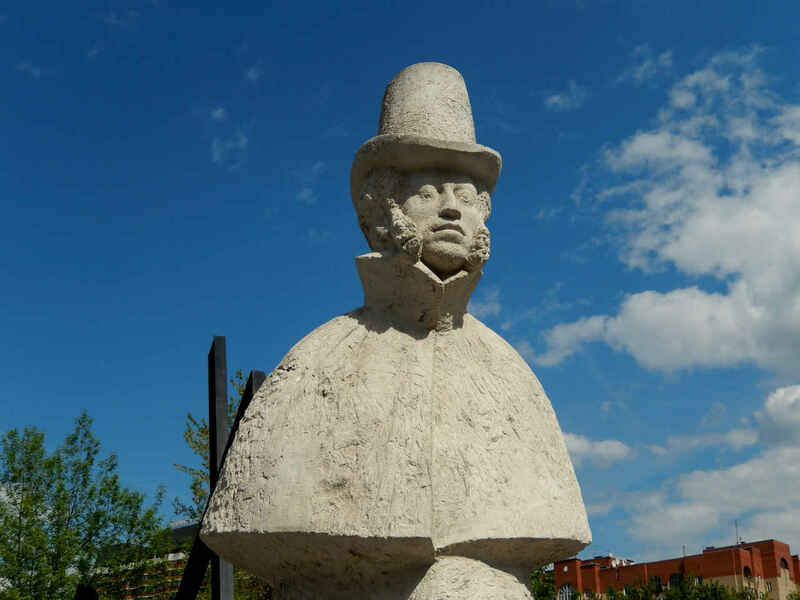 When Pushkin’s company came in to play the next block of shows, he found that Burganov had placed two of his sculptures in the middle of the bunker – the main performance space, and he demanded that they remain there from now on. The director was furious, refused to agree, and that was the end of that show. Short-lived but genuinely brilliant. Ever since then I have been unable to think of Burganov as anything but a jealous, ignorant individual who couldn’t care less about art and is only interested in his place in art – preferably front-stage-center, as he wanted to be in Misha Pushkin’s Antigone, and more or less as he put himself in that banner towering over Gogol at School No. 59. 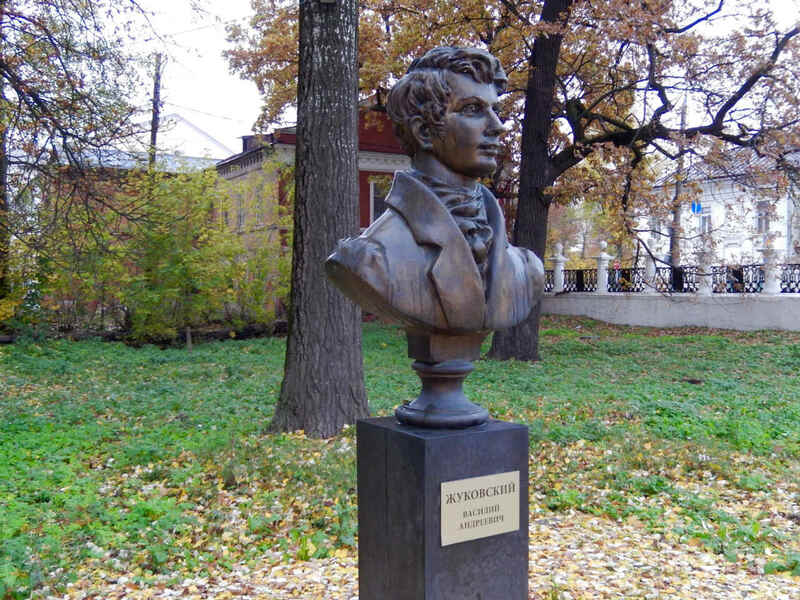 I have written in this space about what a folk figure Alexander Pushkin has become over the centuries. He is a talisman, a hero, a friend, a savior, a protector, someone you can trust when there is no one left to trust. He is the epitome of beauty, honesty, wit, dignity, courage, wisdom – he represents everything good in the Russian people and in mankind in general. 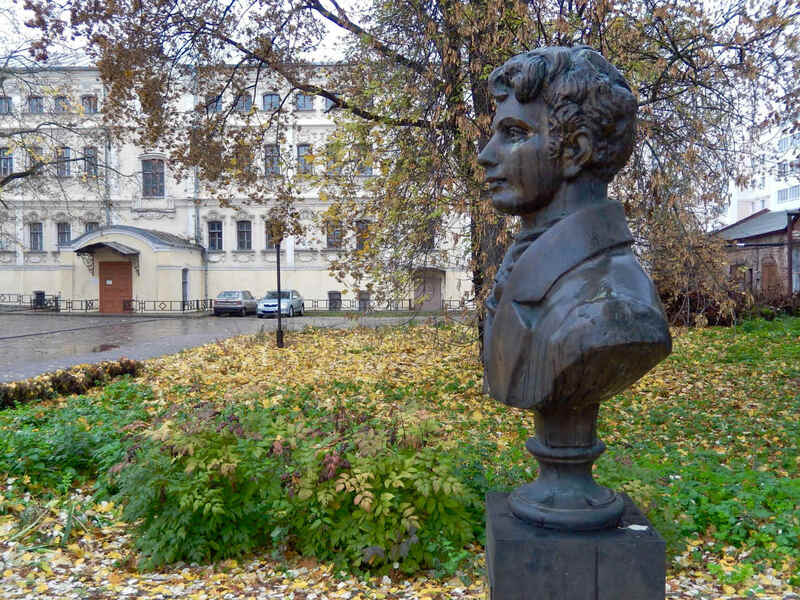 Pushkin as the end-all and be-all, as I have noted more than once, leads at times to wonderful things like the absurdist stories that Daniil Kharms wrote about him throwing rocks and such. And then there is something like I encountered just a few days ago, in fact, one day following the biggest political protest in Russia in at least five years. But this requires a short detour. You see, Vladimir Putin and other friends of Donald Trump (you may boo, I’ll pause happily to allow that) had beaten back the Russian opposition so badly since a series of huge protests took place in 2011 and 2012, that protest either went underground, to jail, or merely died (or, in the case of Boris Nemtsov, was murdered). And then, to everyone’s surprise, to the astonishment of all from politicians and rebels to parents and schoolmasters, an enormous group of disgruntled young kids – virtually all still teenagers – poured out on the streets March 26, 2017, to let the world know they were unhappy with Putin’s government and policies. They were called out by a fearless man named Alexei Navalny, but it is one thing to be called, and it is another to answer the call. What took place March 26 had commentators reaching for superlatives in a way I had not seen in regards to this topic for half a decade. Facebook and Twitter were abuzz. Who were these kids? Where did they come from? What is going on? There were many answers, many details, many excellent explanations as to why and how such a huge, virtually spontaneous demonstration could come about. Those analyses are important and I suggest you track them down if you’re interested in the topic. But in the aftermath I found one response that beat the hell out of everyone else’s. It was a parable written by a writer I first encountered when her name was Oksana Velikolug. She now goes by the name of Kseniyka Smit (or Smith – she married an admirably disgruntled Brit who has lived in Russia with her for many years now). Kseniyka is a writer and performer (I first saw her on stage in Boris Yukhananov’s brilliant production called The Tale of the Upstanding Man a decade or so ago.) And she responded to the March 26 protest as a writer would – she condensed it into a few pithy thoughts, a couple of laughs and a few wicked satirical barbs, then put it out into the world to live its own life. Digression No. 2. The protest march the other day ended up centering around Pushkin Square in the center of Moscow. The monument to the poet there became something of a participant as protesters and police occasionally climbed up the sides of the pedestal chasing one another. Or, perhaps that was artistic license taken by Smit. I do know for a fact that there were a few chases up and down light poles. But this is moot as regards Kseniyka’s story, as you will see. What Kseniyka did was to place this event squarely in the middle of the rich field of Russian Pushkin lore. She brings Pushkin to life in the guise of all those qualities I mentioned above – savior, protector, wiseman, defender. 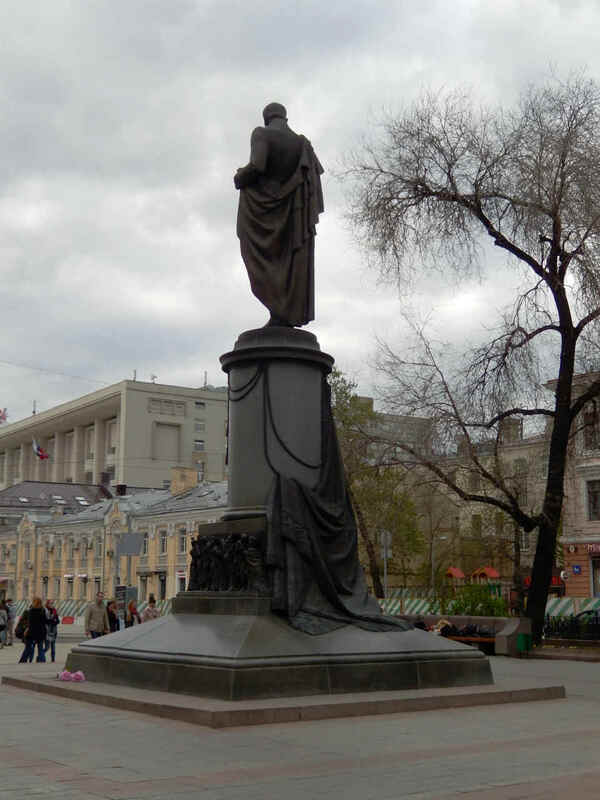 She has good precedent for doing so, since in one of Pushkin’s own most famous narrative poems, The Bronze Horseman, Pushkin brings a statue of Peter the Great to life and sends him chasing after a young man who dared curse him. 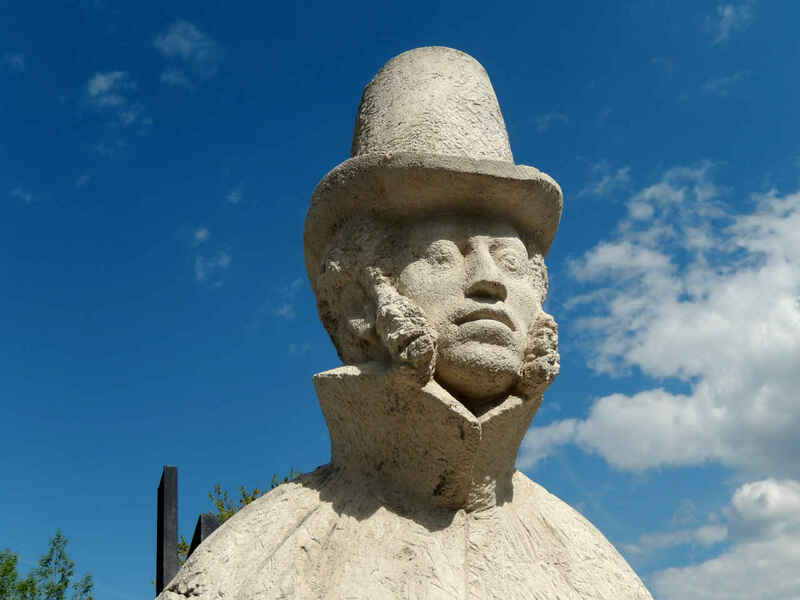 For good measure, Pushkin also wrote a brilliant, brief version of the Don Juan story, called The Stone Guest, in which the statue of a man Don Juan murdered comes to life and clasps his hand in a deathly handshake. Kseniyka refers to that in her nod to “the Commodore” in her little story. But where Pushkin’s Bronze Horseman and Don Juan were threatening, vengeful figures, Smit’s Pushkin is a knight in white (perhaps green) armor, a kind, loving grandfather, a genius of pure beauty (if I may allow myself that little quote). I loved Kseniyka’s story so much that I translated it the moment I found it on Facebook and reposted it. You can find the full translation after the jump here. However, first let me take care of business. 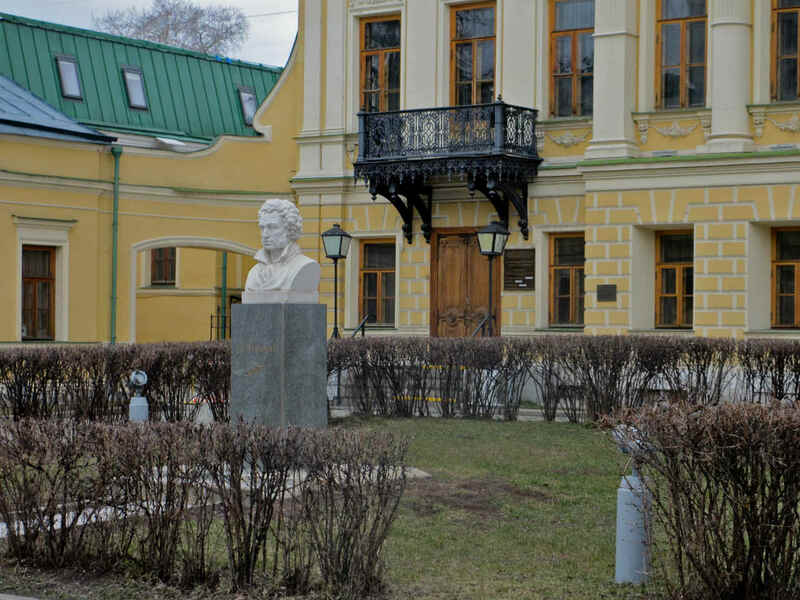 Since I have already written about the Pushkin monument on Pushkin Square, I decided to let a bust that stands in front of a Moscow library named for Pushkin do the pictorial honors for today’s post. Pushkin was christened in the cathedral across the street from here, and he grew up running around his uncle’s house just down the street. 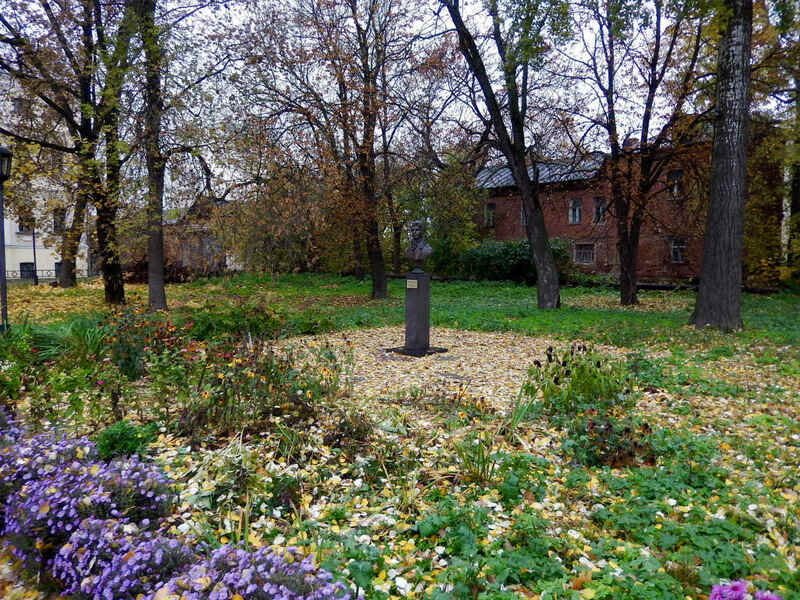 So there’s a good reason for the bust and the library named after him to be located at this spot at 9 Spartakovskaya Street, Bldg. 1. The library was founded in 1900. 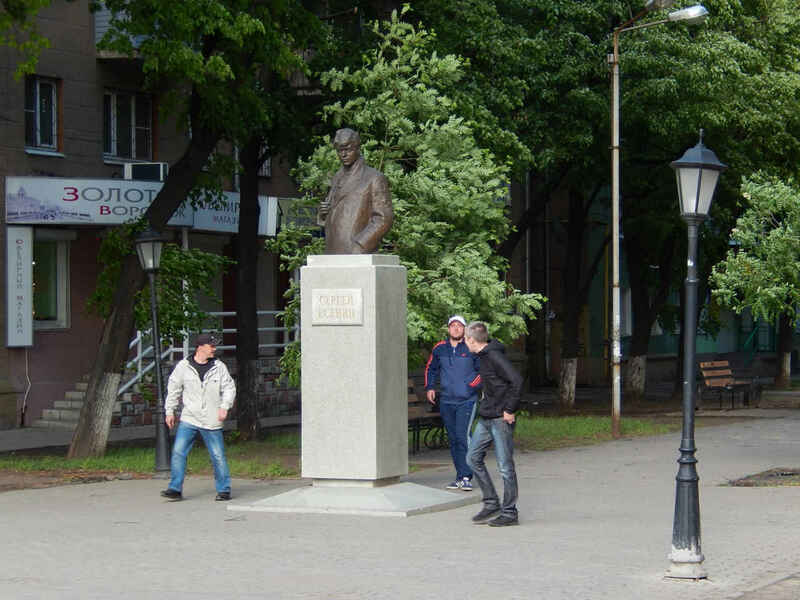 The bust appears to have been made by Vladimir Domogatsky (1876-1939), although the exact date of its unveiling may have been lost. 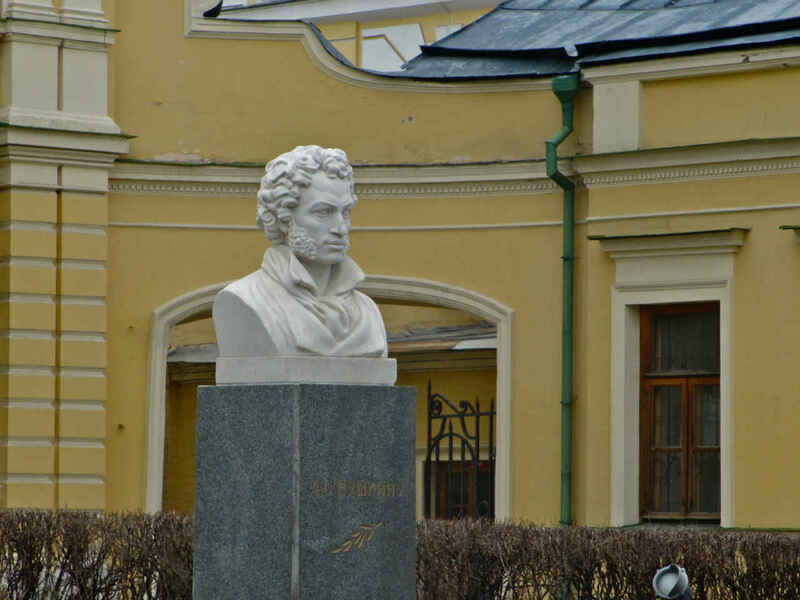 A webpage discussing the history of the library and its environs states that the bust “may have been” erected in 1937 (one hundred years after Pushkin’s death). On the square flooded with a spring sunshine, still not entirely confident in its own powers, policemen seek to restore order, beating protesters with clubs. The protesters, seeking to preserve their human dignity and the freedom of their children and grandchildren, appeal to the heavens. 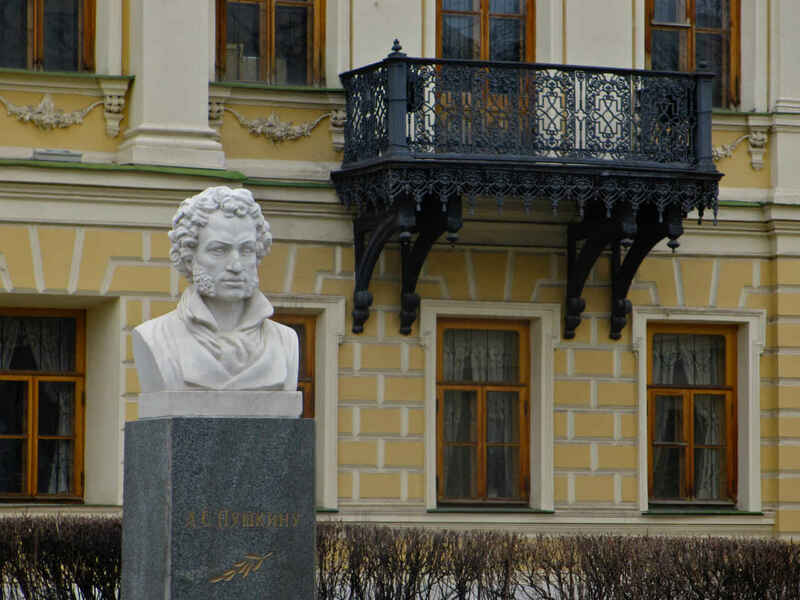 Beyond all this, somewhat green from all the years, Pushkin gazes down upon the goings-on. Suddenly… wild squeals pierce the air. Policemen who had clambered up onto the monument’s pedestal recoil in horror and retreat helter-skelter. Lord Almighty!!! Pushkin has twitched! The Commodore has come alive! The protesters are frightened too and are just on the verge of turning tail and running, but they stop in their tracks, petrified. A powerful foot comes down on the ground, followed by another. An enormous hand carefully plucks up a few youngsters and a few oldsters, too, and plants them on the towering height of a pair of shoulders. “You say I have not the right to do that?” a voice rumbles, seeming to come from somewhere beyond the clouds. The policeman doffs his combat helmet. 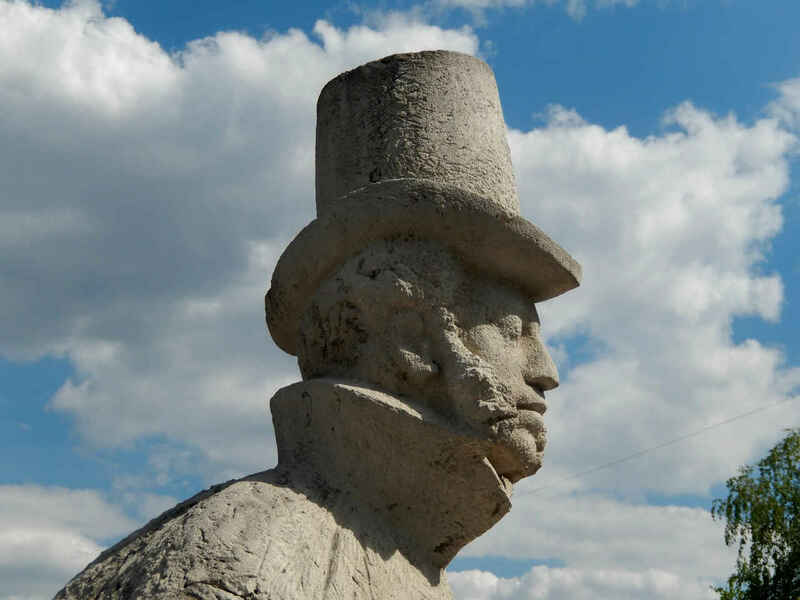 Pushkin seats people on his shoulders and walks and walks and walks… all across Russia… until he comes upon the presidential motorcade racing toward the border. Pushkin thoughtfully plucks up the presidential car and shakes the President out of it. The President falls in his palm. “Oh, such a tiny one!” he says and bursts into laughter. President Putin is white with fear and rage. He would burn this monument if he could. Pushkin cradles him in his hand, and throws him high up in the air… far, far, far away…. Need it be said that this story, as originally published in Russian on Facebook, is fully copyrighted by the author Kseniyka Smit, 2017. It may not be reproduced without her permission, and my translation of it may not be reproduced without my permission. Should it be necessary we can both be reached right here by way of this blog site. How does that saying go? If you have nothing good to say, talk about Pushkin? Something like that. What more can I say about Pushkin? I’ve written about him a million times here already. But with a Trumped up world Putin’ everybody on their heels, there must be some escape. That’s a Nobel Prize laureate providing me solace right there. An American Pushkin. 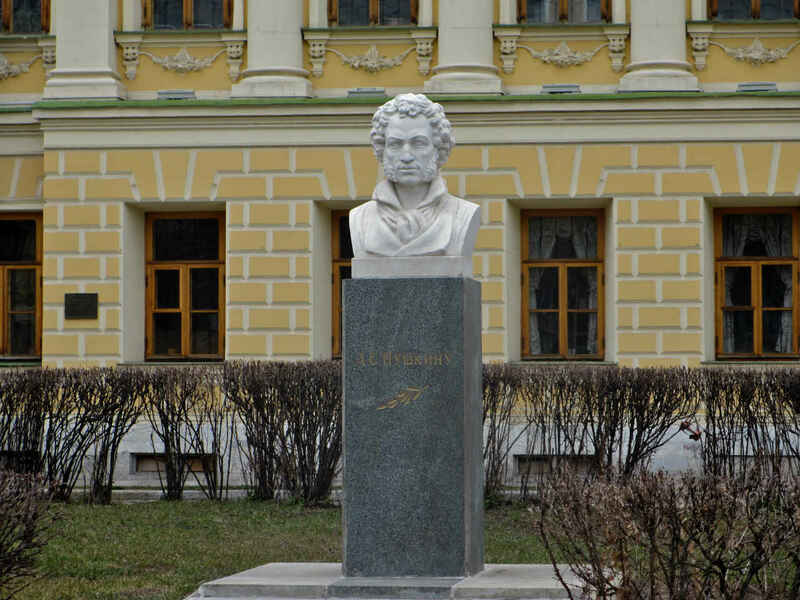 Pushkin never won a Nobel Prize. Both writers had curly hair; were short, loved women and were loved by them; were seen as the voice of their generation and of their nation. Interestingly, each had forebears that brought the family to their countries from lands afar. 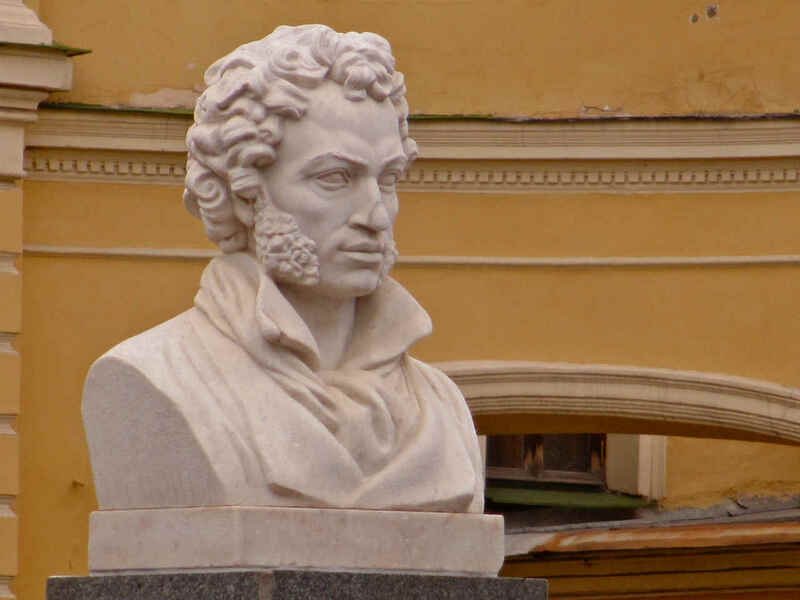 Pushkin’s great-grandfather Hannibal came from (perhaps) Ethiopia to Russia. All of Dylan’s grandparents came from Russia to the U.S. Still, to be honest, I’m stretching it a bit to draw Bob Dylan and Alexander Pushkin into the same conversation. You’ll notice I wrote “an” American Pushkin, not “the” American Pushkin. As omnipresent as Bob Dylan is – in American and even world culture now – he came too late to be what Pushkin was to Russian culture. Modern culture by the time of Dylan’s ascendency was fragmenting into too many different spheres of influence. It’s true that he has spanned many of them as few others have in his time. But, still, it’s a very different world from the one Pushkin inhabited. 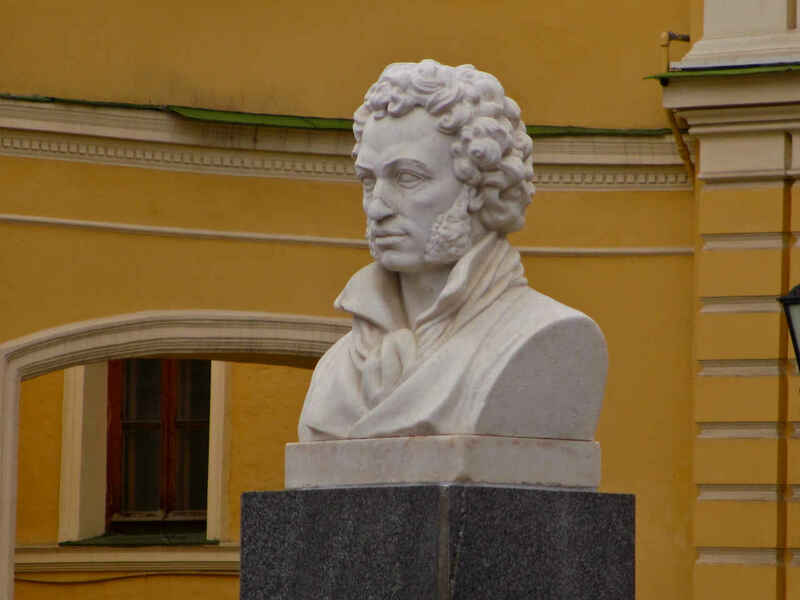 The famous phrase – repeated too many times in this space already, yet still unavoidable – is that “Pushkin is our everything.” It’s a joke and it’s the truth. I mean it’s a joke because it’s almost become a joke. Almost. But it’s only “almost” become a joke because it’s true. It isn’t a joke. I love the way the phrase came into being. It was coined by literary critic Apollon Grigoryev 22 years after Pushkin was gunned down in a duel by a capricious and dashing Frenchman who was, at that time in February 1837, a lieutenant in the Russian army. The gallery may now boo and hiss. That was your cue. D’Anthes, the killer of the great Russian poet, is one of the great villains in world literary history. We boo him, we hiss him, we revile him. We damn his soul. But we can’t bring Pushkin back. 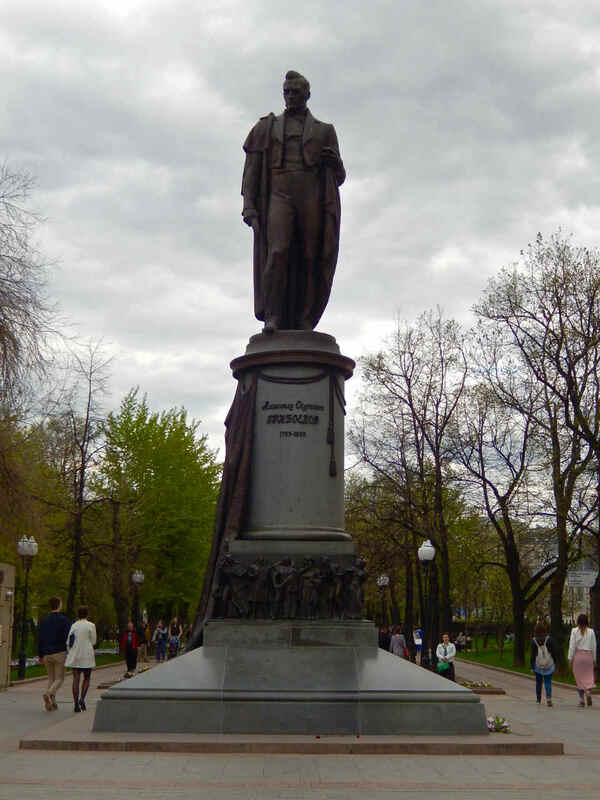 Grigoryev (1822-1864) was responding to a two-part article, “A.S. Pushkin and the Most Recent Publication of his Compositions” (1855), penned by fellow critic Alexander Druzhinin (1824-1864). It’s a wonder we can even feed ourselves. Our coats, our shelves. We, he writes, it is down to us. Love hasn’t faded fully in my heart. I have no wish in any way to make you sad. I hope another now will love you just the same. But mama, you are just on my mind. Mama, you are just on my mind. So, there you have it. For what it’s worth, as Stephen Still might say. Dylan and Pushkin. 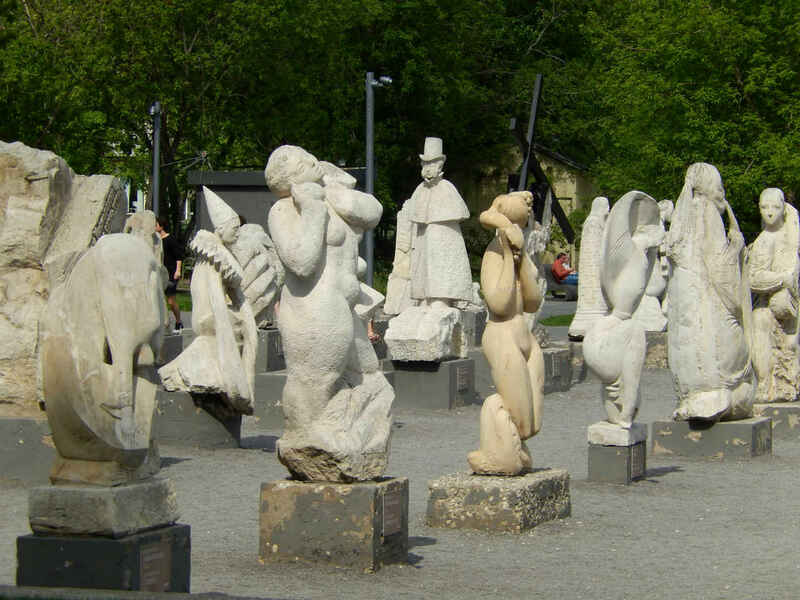 The images accompanying my thoughts today are from the sculpture garden at Muzeon. It is called In Pensive Hours and was created by the Moscow sculptor Gennady Krasnoshlykov (born 1955). 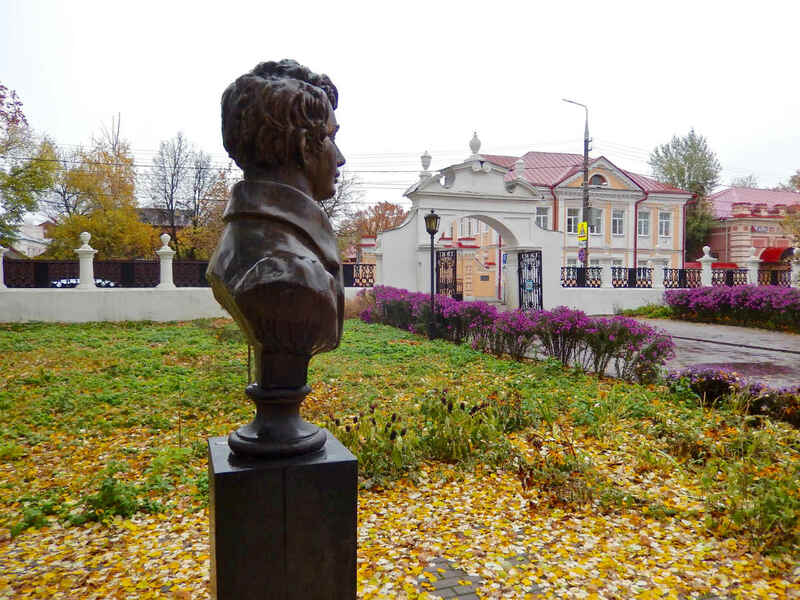 It shows Pushkin traversing a tiny bridge, presumably an abbreviated form of some bridge in St. Petersburg, and, perhaps, bucking a bit of wind, rain, sleet or snow. We get that notion as much from Pushkin’s coat, gently flowing backward at the bottom back, as anything. 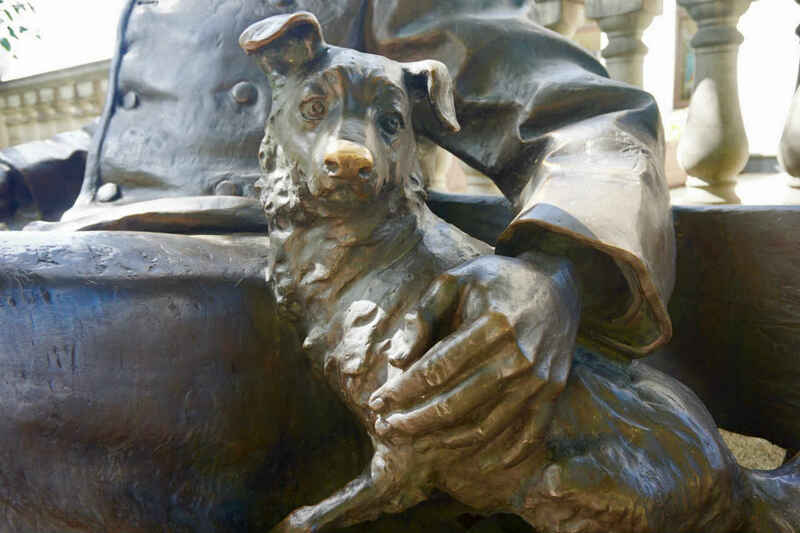 Pushkin’s eyes are open, although they are so faintly drawn in that they give an introspective feel to the sculpture. 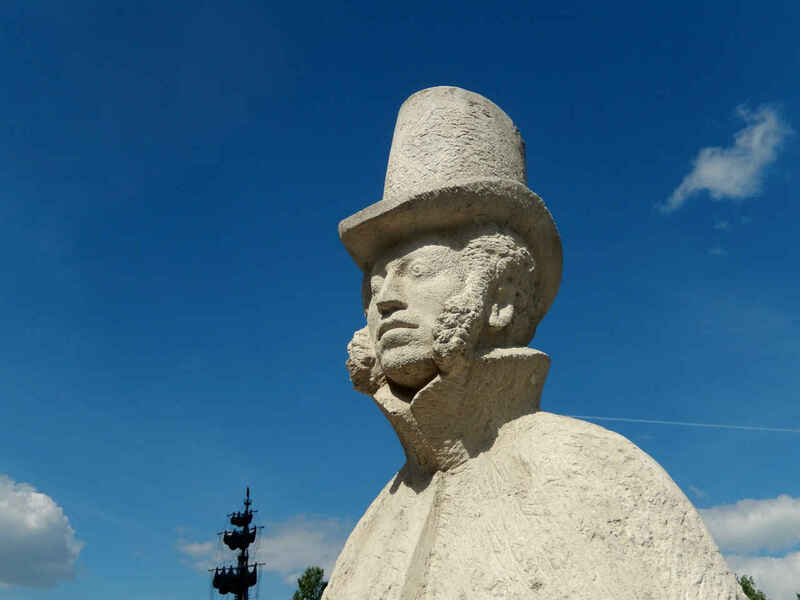 Another reason for the work’s sense of isolation is that the only things showing from underneath the hat and billowing coat are his face, some hair and his ears. His feet may be buried in snow or just unimportant. In a similar fashion, his arms and hands may be tucked under his greatcoat or may simply be considered unnecessary by the artist. It’s a very nice piece that has a ring of truth and authenticity to it. 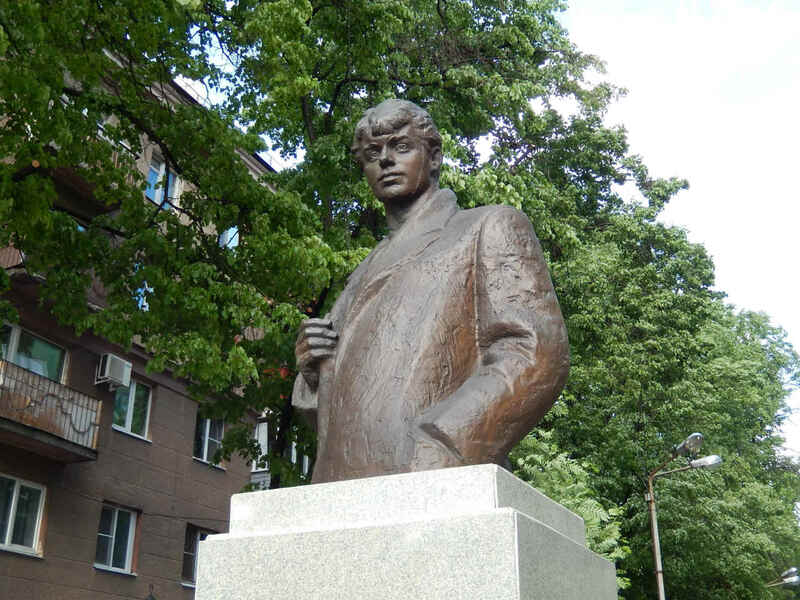 Sergei Yesenin (1895-1925) checked into the Angleterre Hotel in St. Petersburg 91 years ago today. Three days later, December 28, 1925, his body would be carried out, dead, by a few friends, including the poet Nikolai Leopoldovich Braun. The official version then, and the version that remained in force until the late ’80s/early ’90s was that Yesenin had committed suicide. He was found hanging from a rope in his hotel room, or so they said. In fact, that version has taken many hits since the Perestroika days. Nobody has proven anything beyond a doubt, and the cautious still tend to posit suicide as the probable reason for the poet’s death at the age of 30, but I must say, that rendition looks weaker and weaker as the years pass. Yesenin was a bit of a loose cannon and the Soviet State, slowly getting a grip on things and people by the mid-1920s did not like surprises of the kind that Yesenin could toss off. This was particularly true because Yesenin was wildly popular among the people, thus anything he said or did could have serious influence on public opinion. Add to that the fact that authoritarian states simply don’t like anyone or anything that questions order – directly or indirectly. Yesenin, by his freewheeling behavior, did anything but support the notion of moderation or orderliness. He loved to drink, he loved to carouse, he loved to play practical jokes. He had a flair for picking unorthodox wives, one being the American dancer Isador Duncan (at a time when suspicions about foreigners was increasing daily), and another being Sophia Tolstaya, granddaughter of the great writer Leo, and, therefore, a member of a family, the prestige of which the Soviet authorities wished very much to use in their favor. If that wasn’t enough, in the period leading to his death, Yesenin battled clinical depression, even spending some time in an insane asylum where the doctors were “unsuccessful” in treating his illness – if that’s what it was. Sound like a historical sieve? Does to me. So there, at least in Kuznetsov’s version of events, are the two men who killed Yesenin: Nikolai Leontyev and Yakov Blyumkin. He was Pushkin, Yesenin and Vysotsky. And there will be no one left in Russia to play!